Have you been opening mail and making a stack of Graduation invites? Well I have, and I have been finding all these fun “new” creative invites that really show the grads personality and interest. Ashley created her own unique announcement, a card printed on both sides with a collection of pictures and her favorite verse. What a fine young man and the invite totally reflects who he is! These unique and personal cards allow the sender to share about themselves and their future plans. One very special young man has worked with us over the past year at Miss Cayce’s Christmas Store and we wanted to honor him with a Picnic in the Park! Our High schoolers have open lunch and we picked a park close to the school. 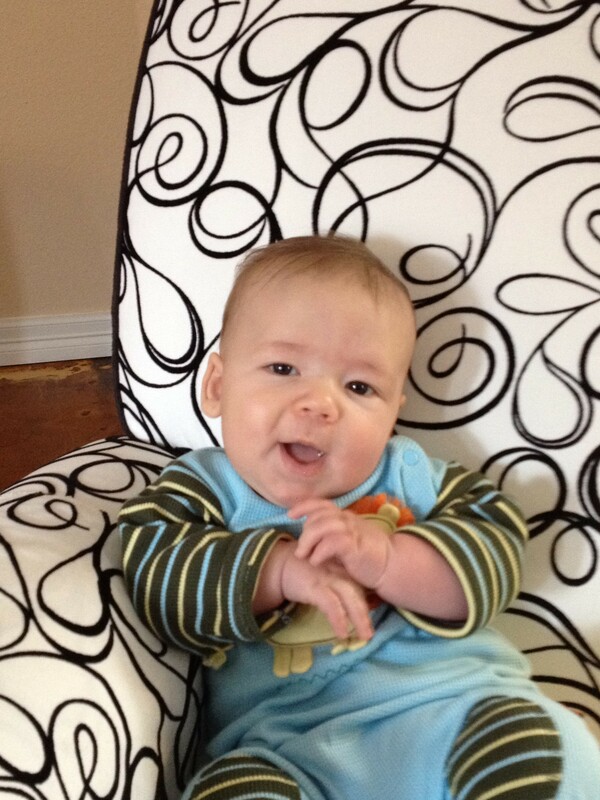 Coby sent out a text to all his friends with date time and location! 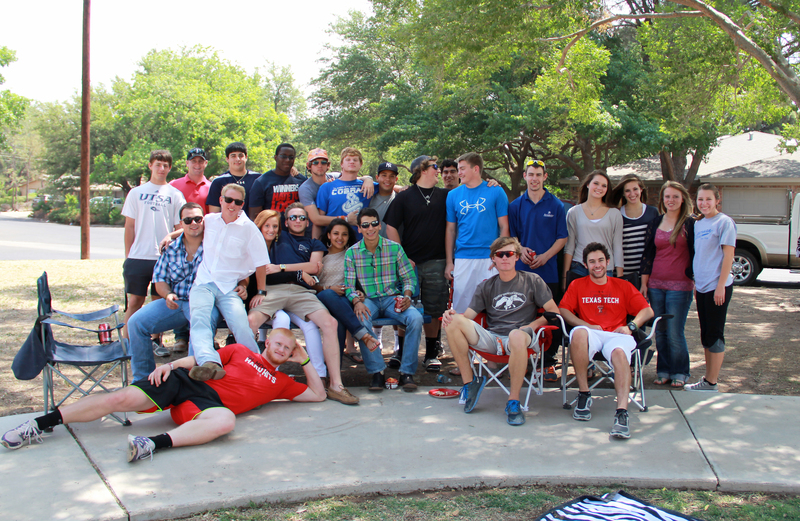 Graduation picnic in the Park! Everyone loved the picnic and the weather was perfect. We provided lunch and laid out quilts and blankets in the shade to enjoy the food and friends! In the next post we will share the menu, recipes, and table decorations! 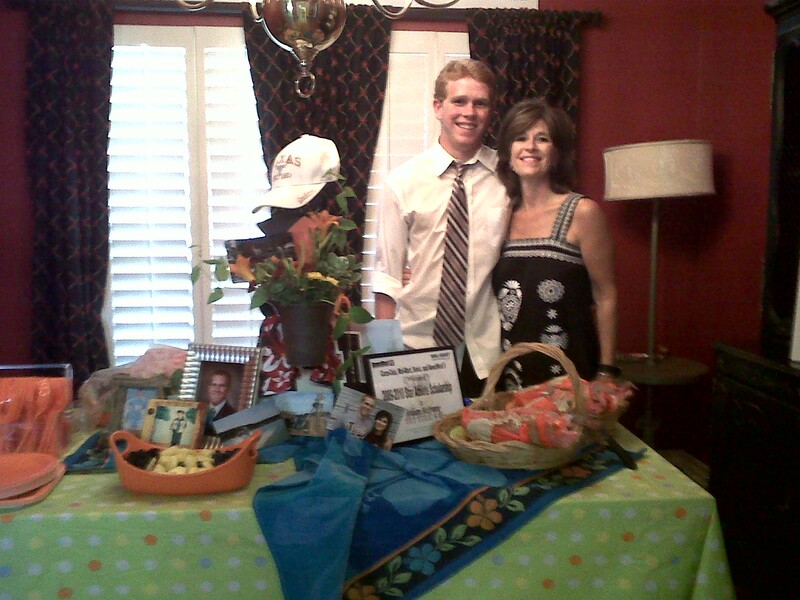 The honoree, Coby, who is now a Texas Tech Red Raider! 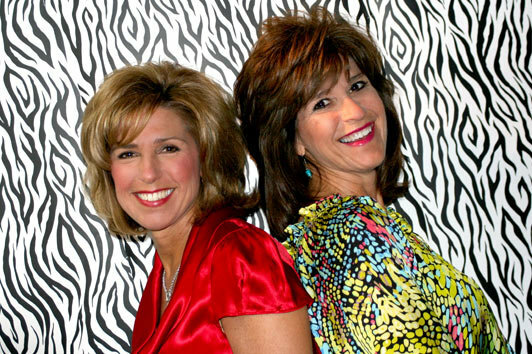 Show Me some mother’s love…..
Mother’s show love at so many times….. for their husbands, kiddos and family! We wanted to share with you a Mother’s treat that Amanda and her kids made to show some love to their Grana (Kathy) and Great Grandmother (Betty). 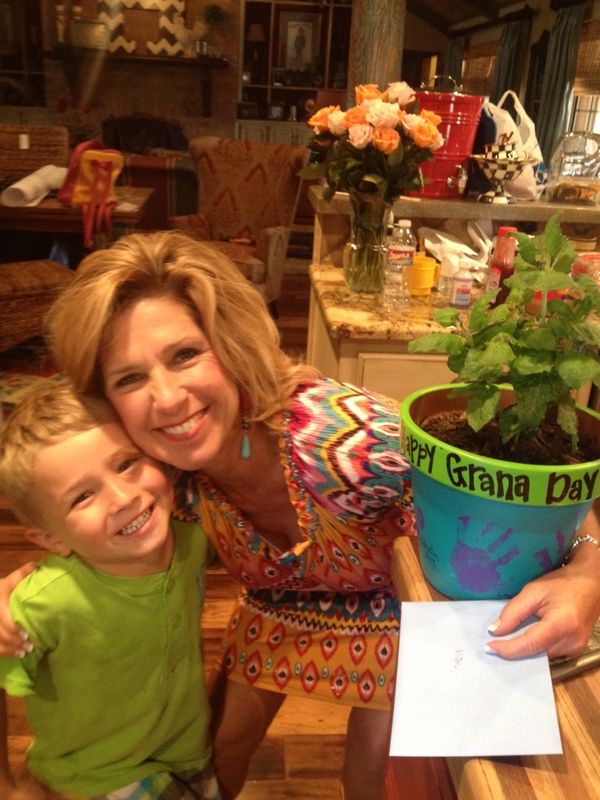 Kaydin shows Grana some love! Take this time together to teach your children about who they are making the presents for! 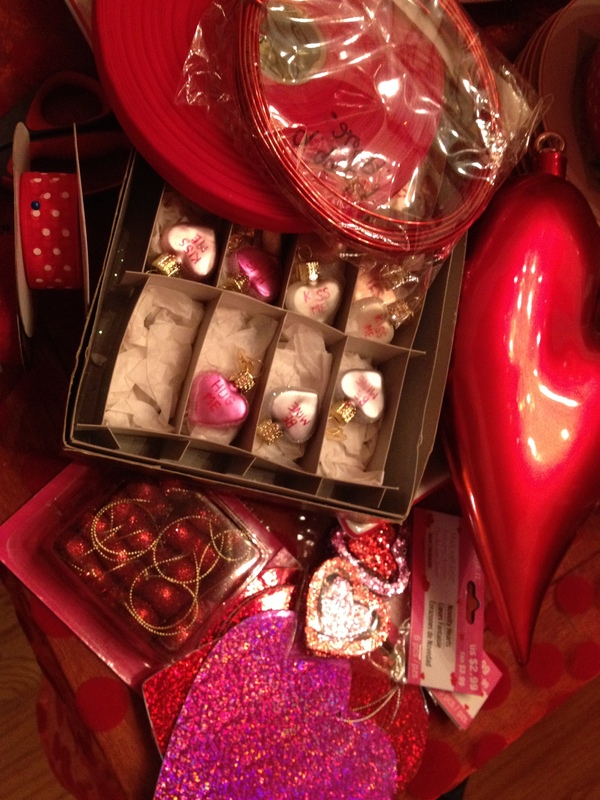 ****And lots of patience ……………..
We chose a variety of sizes and shapes, some were just $1! 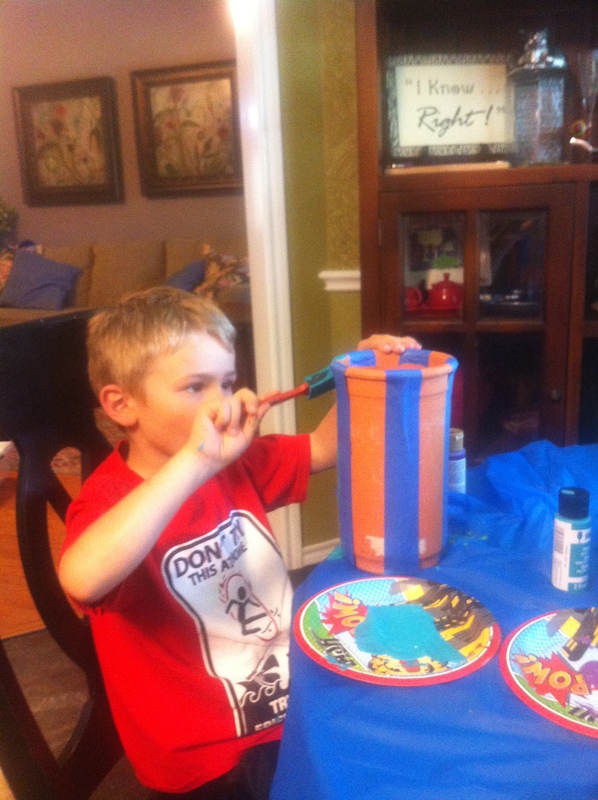 Kaydin was super serious about his painting! 7. Let dry and remove all tape. 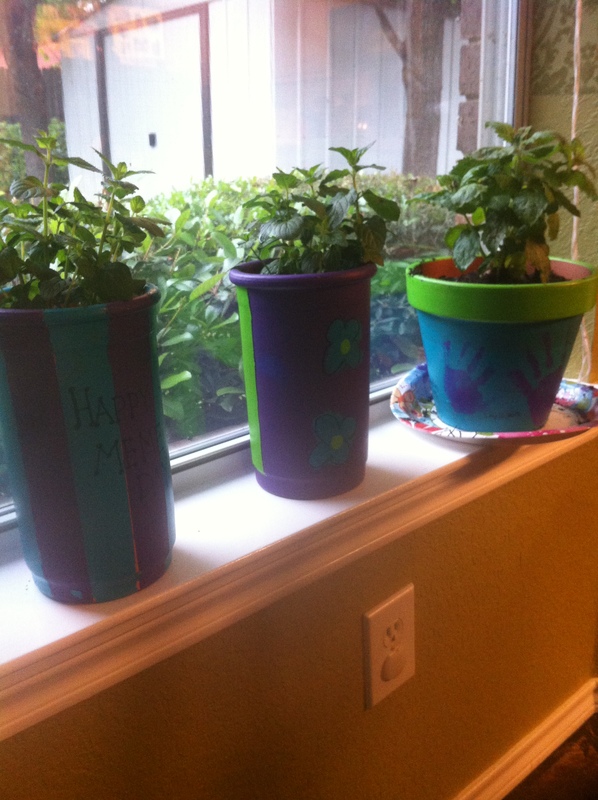 Grana’s favorite summertime drink is a “Mint Mojito” so we planted with mint! we love our Grana, she is special and always show us some love……. 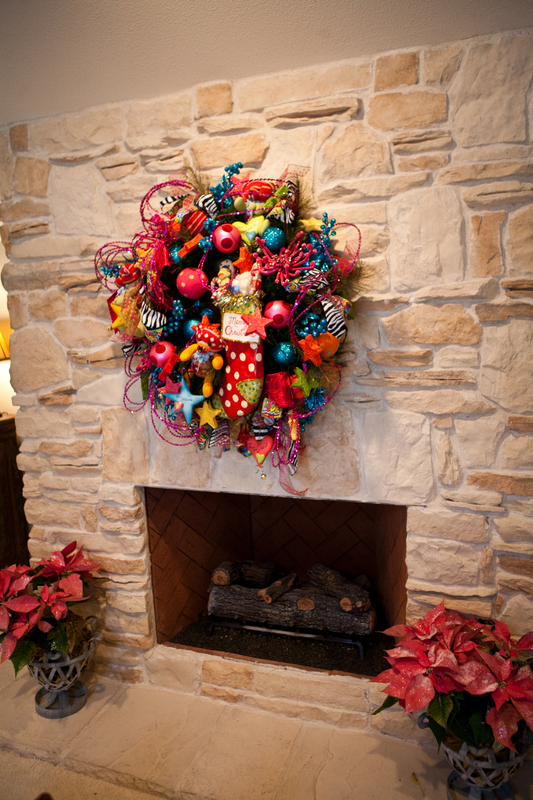 Fun, colorful wreath adds whimsy to this fireplace! 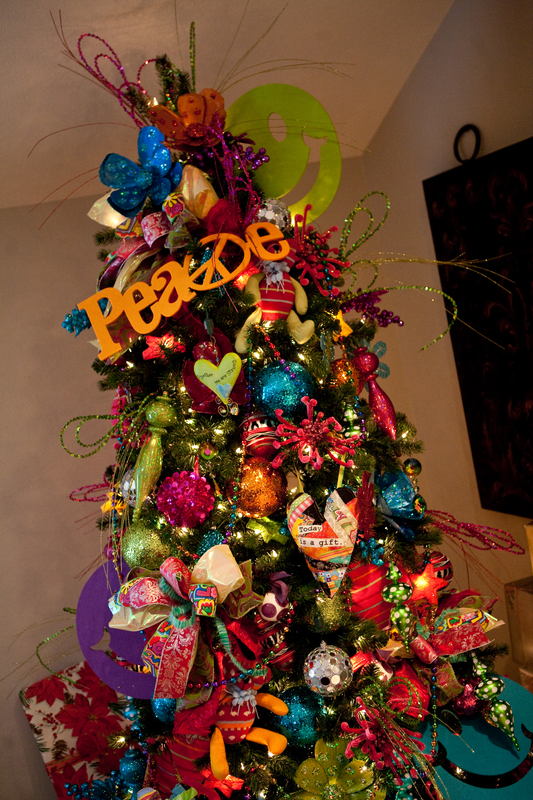 Peace, love and joy is what you’ll find on this groovy holiday tree and wreath. Guests are greeted with smiley faces mixed with the brightest of colors for a Cool Yule. Lime green, purple, royal blue, orange, turquoise and hot pink make Christmas red and green look dull! Sequin tinsel sprays, mixed prints and patterns in balls, ribbon and floral will put the “happy” in your holidays. 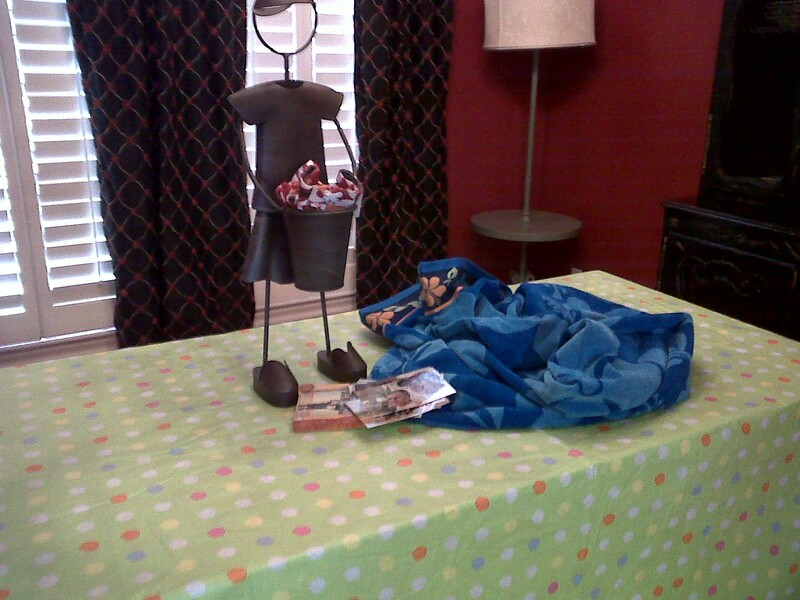 Teen and Tweens will love decorating this fun theme. 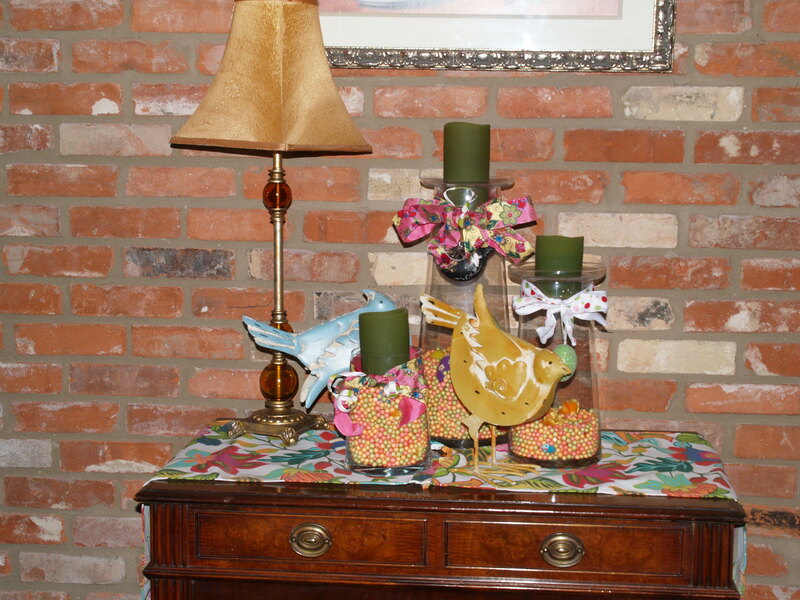 Last Minute Easter & Spring Decorating! I like to have at least one place in my home that I change out to reflect the season or holiday. I may not go all out for every holiday so this gives me an easy go to place! I love my candle jars. 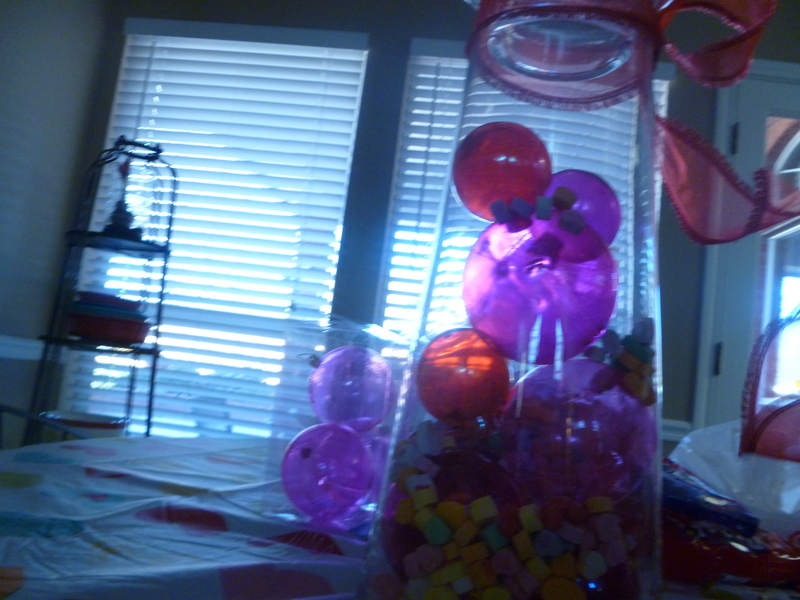 For spring, I fill them with colored styrofoam balls that I got at Hobby Lobby and tie them up with cute ribbon. The metal chicks are left over from a church women’s ministry dinner that I had done a table for and you can’t beat battery operated candles! I live in a house with four boys who are always playing ball or wrestling or throwing pillows. I came home one day and they greeted me with “we have some bad news..” I of course(not a good mom moment) jumped on the what have you done now to only be told oh it wasn’t them but our sweet new girl puppy had chased Cinco, our golden, into the corner and knocked over two of my candle jars! Ugh, I only have so many nice things in a house of boys. Luckily, Becky was able to find me one replacement jar so now I just need a top for my small one and I’m back in business! I’ll leave the spring up until the kids are out of school then the jars get filled with beach sand and shells collected from our family beach trips. Show Me Some “Almost Free” Graduation Centerpieces! 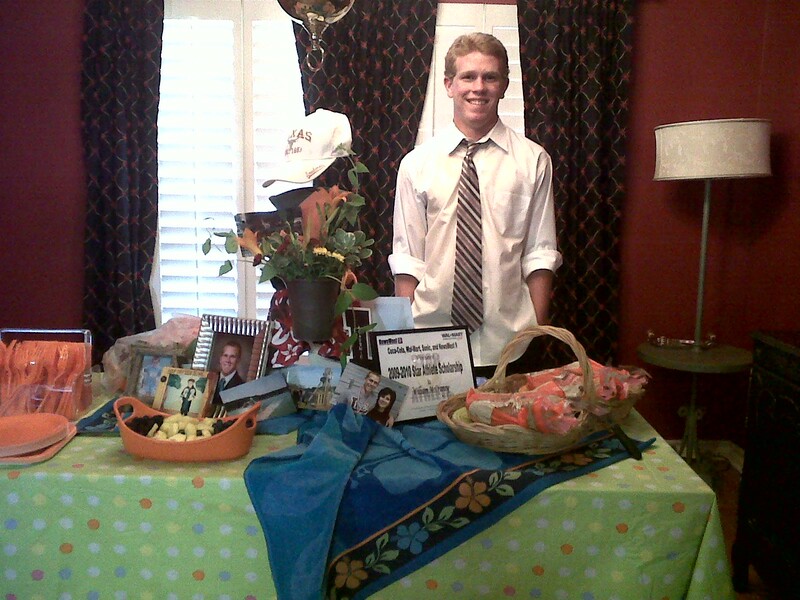 I can’t believe it has been a year since Will graduated from high school! He has enjoyed a successful year at the University of Texas, Hook’em! 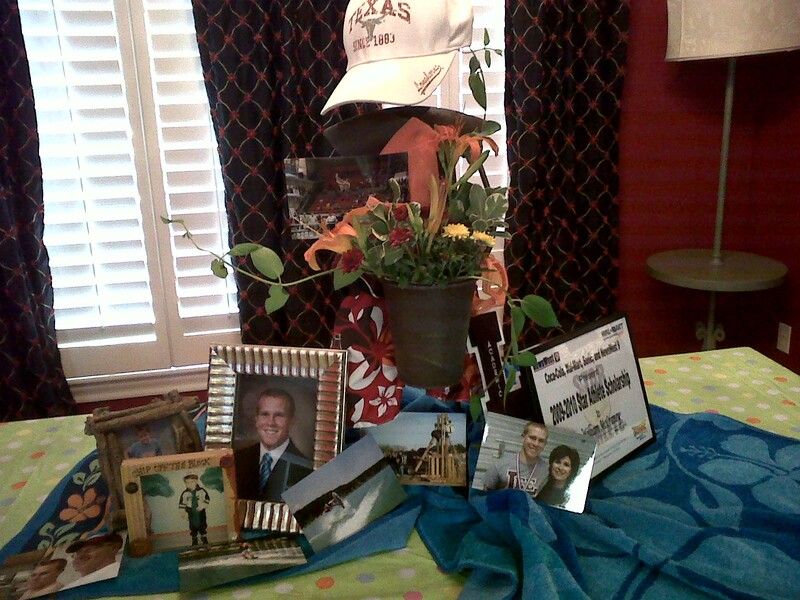 When I have been out and about, friends, customers and acquaintances have asked me for ideas on graduation centerpieces. That is why I wanted to share with you what I have done and hope that it will spark some ideas for you and your graduate! 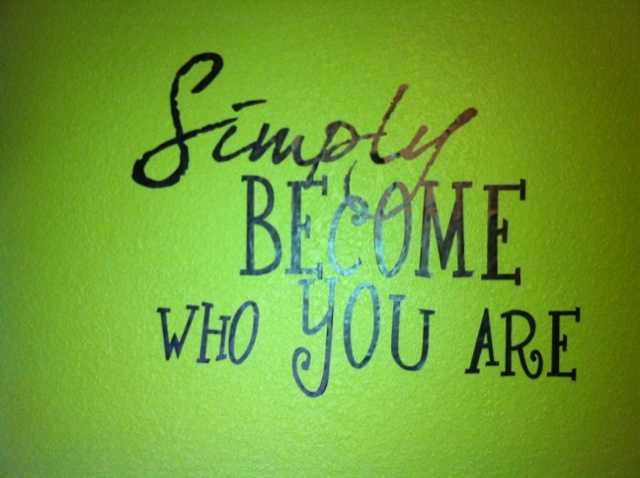 The philosophy behind “Show Me Decorating” is to create (for you), inspire (you), educate (you) and (you) decorate. with that in mind we like to start with a theme or color story. In this case I built my theme around Will and his interest, diving and graduating! It was fun combining the Lee marron with the Texas burnt orange! (almost like oil and water, or Aggies and Longhorns! Ha!) I used an iron boy that we purchased several years ago from Bed Bath and Beyond. He was intended for use in your garden, however we have dressed him and the iron girl, up in wedding attire, baby and birthday decorations for various showers and parties! 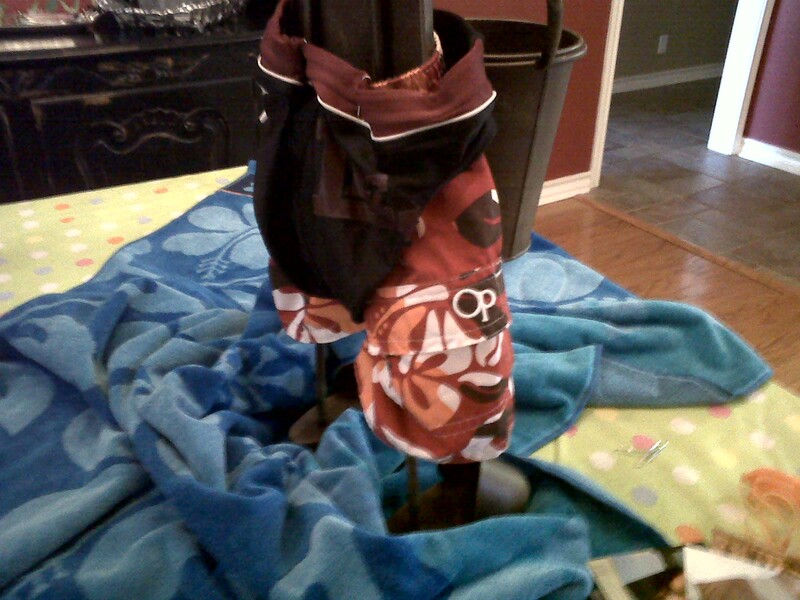 Because Will is a spring-board diver, I chose to dress the boy in an orange swimsuit and Will’s Lee dive suit. 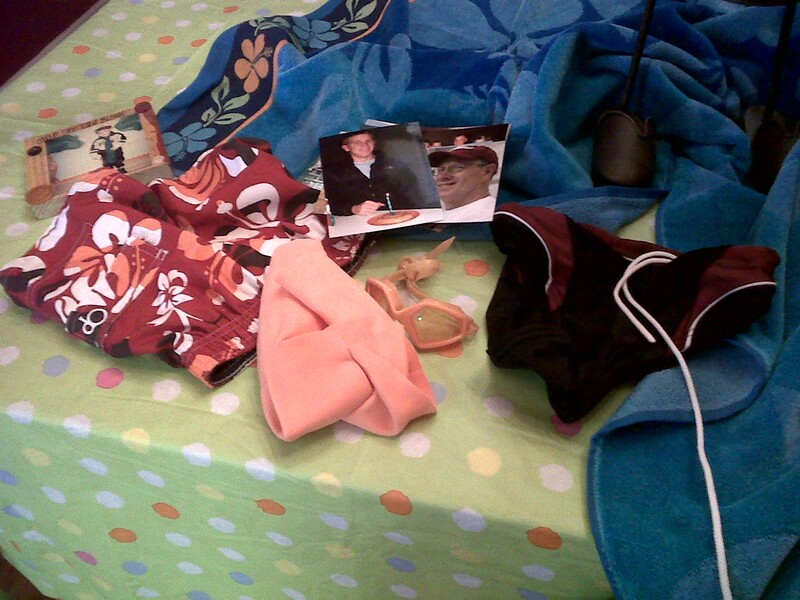 I also gathered up pictures of Will at different ages from my stash and the blue beach towel is my table runner! I love to use unconventional items. Now it’s time to arrange all my stuff. I want to keep in mind that it will be seen from all sides, and to vary the height and size of items for interest. I love how fresh greenery and flowers brighten a centerpiece. I stepped out into the yard and cut lengths of honeysuckle vine to drape, greenery from my shrubs, orange day lilies and some blooms from my maroon mum. I love it because they were basically free! Finished centerpiece just waiting for the food. The UT hat tops it off! It’s time to get the food out and let the party begin. I chose to make my “famous” Hawaiian sandwiches, yum, and Wills favorite cookie bar brownie! Chips and iced down drinks so I get to enjoy all the fun. So the next time you need a centerpiece for your celebration, chose your theme or color story, look around your house and yard and create your very own unique and almost free centerpiece! 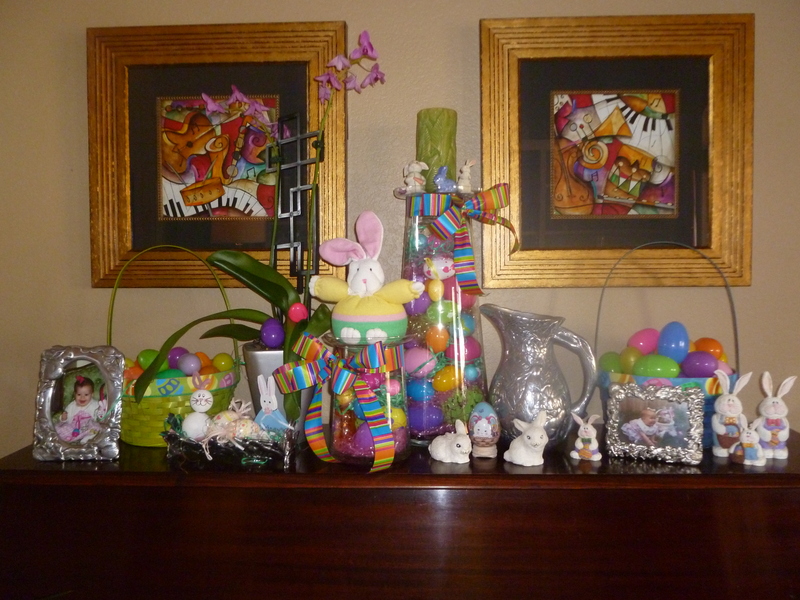 Egg-tra Special Show Me Decorating! Celebrate Easter! 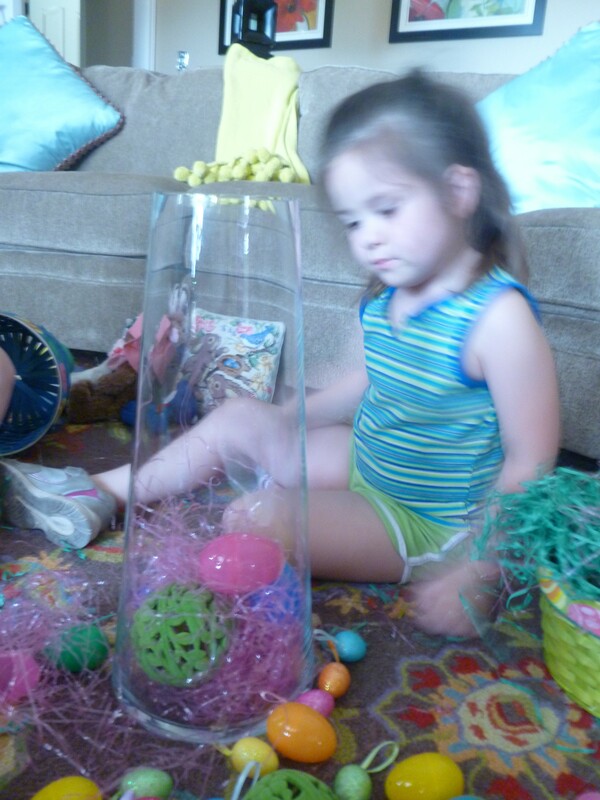 Who knew you could decorate with plastic eggs and Easter grass? 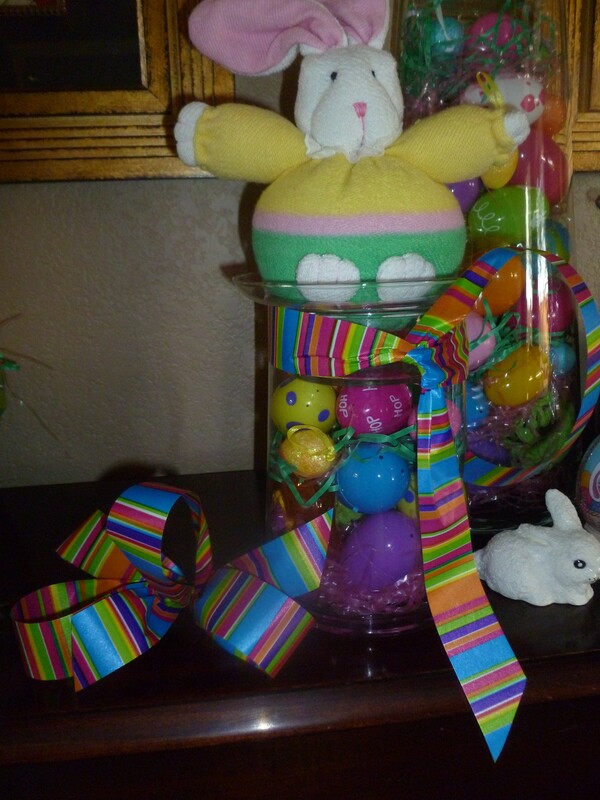 The common plastic Easter egg is filled with candy, hidden, found and placed in a basket with Easter grass, however we“Show You How” these inexpensive items can really add color to your Easter decorating! All the gathered goodies to choose from! 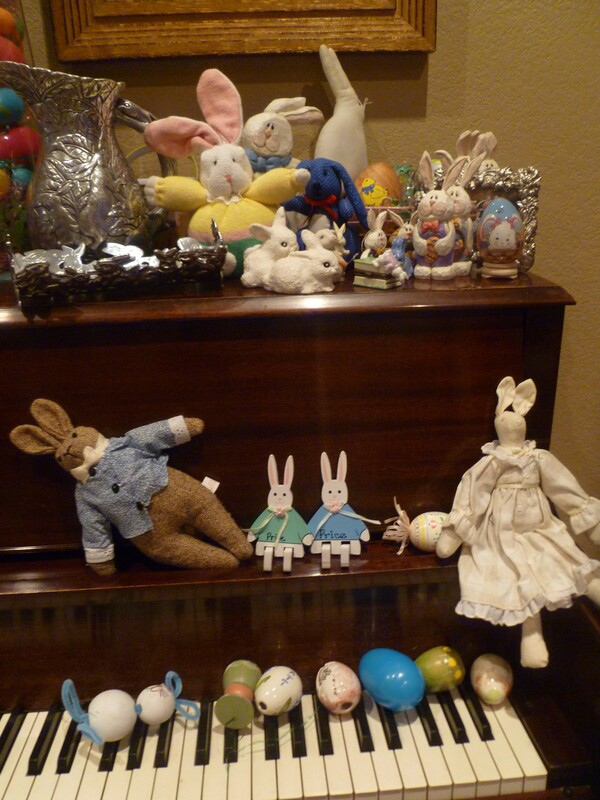 These rabbits and eggs are special and have been collected over many years. It takes me down memory lane thinking of my kids as they have grown up and now grandkids goodies are being added. The touch of silver comes from my collection of Author Court, the original Miss Cayce’s my grandmother, gave all the “girls” fun serving pieces, frames and accessories all in a bunny pattern, perfect to add to my Easter display! Now time to assemble our display. 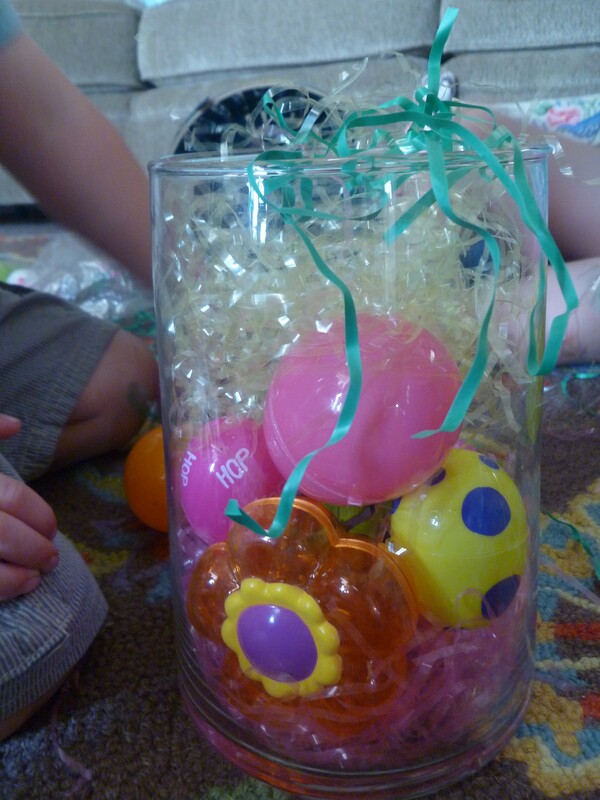 I started with Emma and Ethan helping to fill my candle jars with plastic eggs and Easter grass, you could also use clear vases or jars. 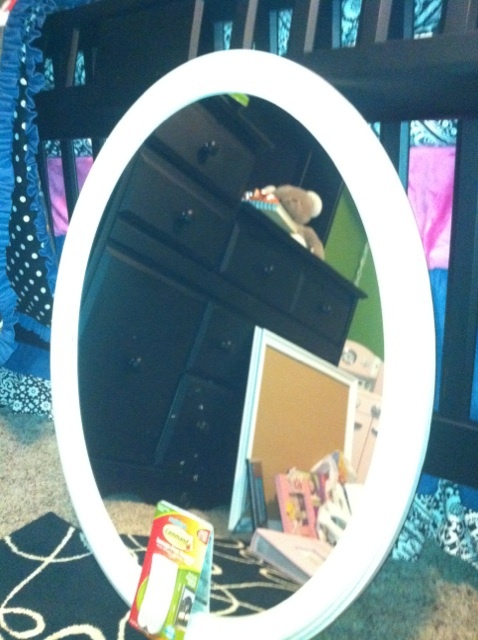 These will become my main focal point and add height. Look at all the eggs! 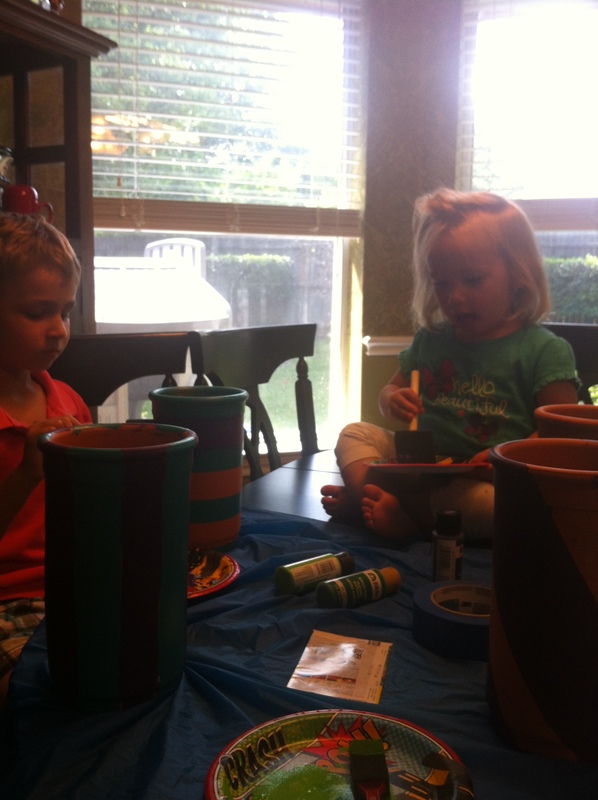 The grandkids had a great time picking just the right color and size to fill their jars. 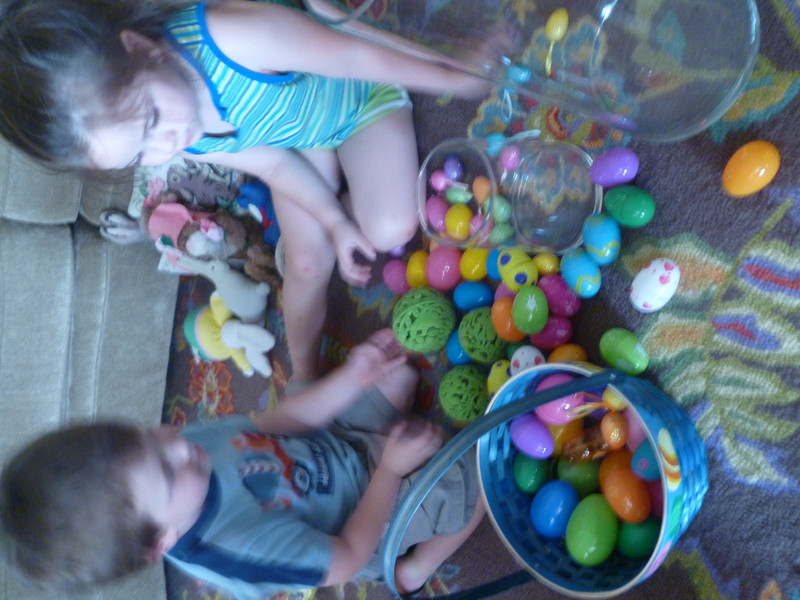 We even found some small glitter eggs in bright colors at the Dollar Tree, and they filled in the nooks and crannies left by the bigger eggs. They are so proud of their creations! 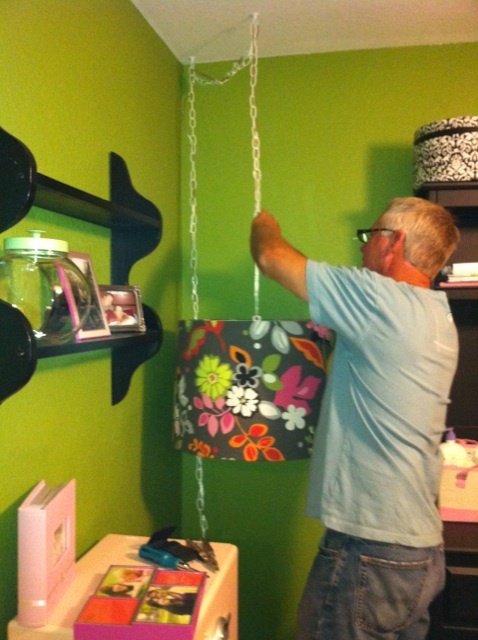 I enjoy including them in the decorating process and can even teach them their colors! 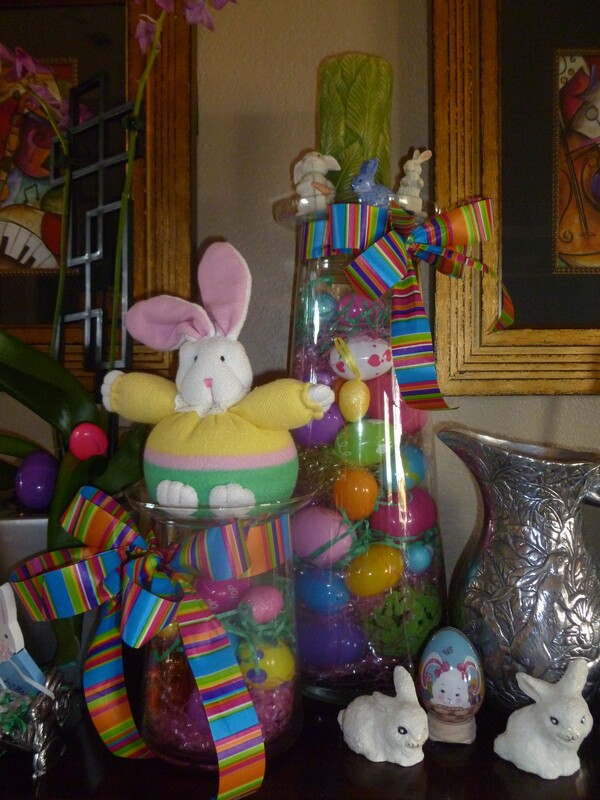 The short candle jar looks cute with a bunny in place of the candle and the taller jars shows off some of my favorite bunnies! 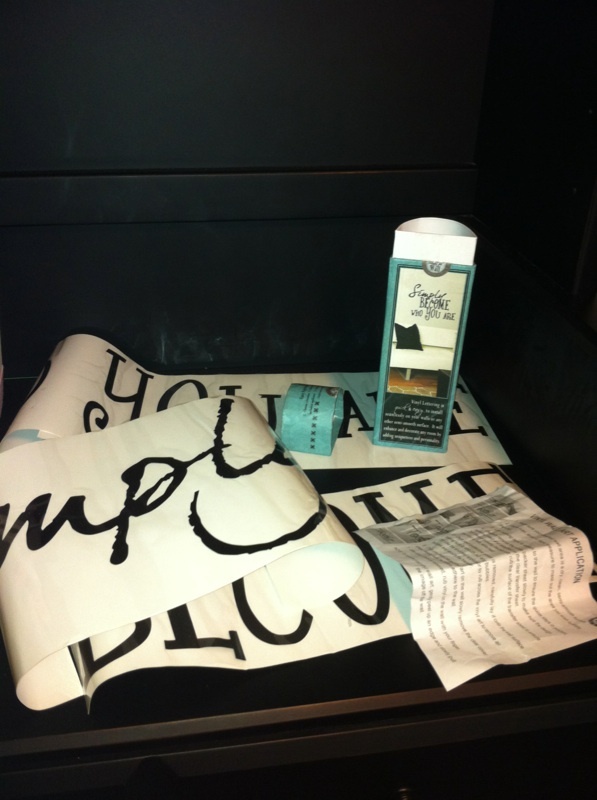 We love sharing our creative ideas that inspire you, educate you “how to” and then you are the Decorator! 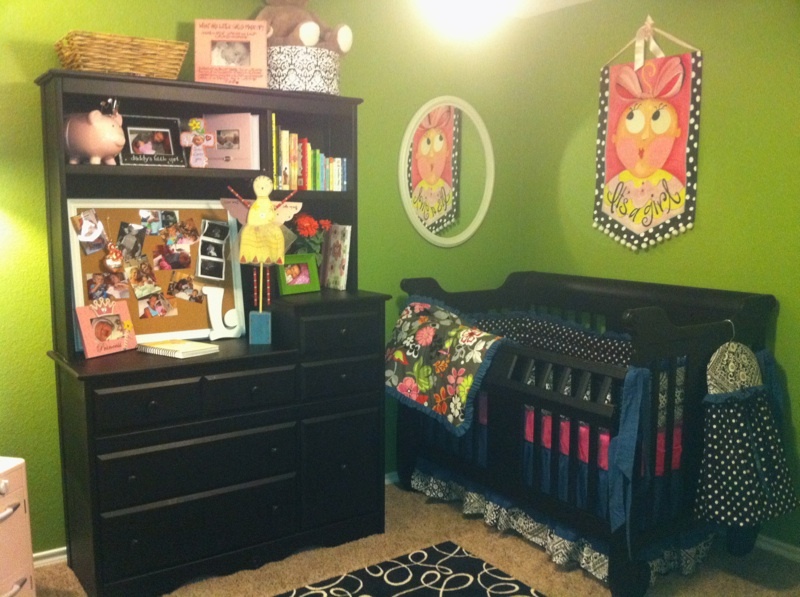 Show Me Another Grand Baby Nursery! Better late than never! That’s what happens when a grand baby is born during Christmas season. 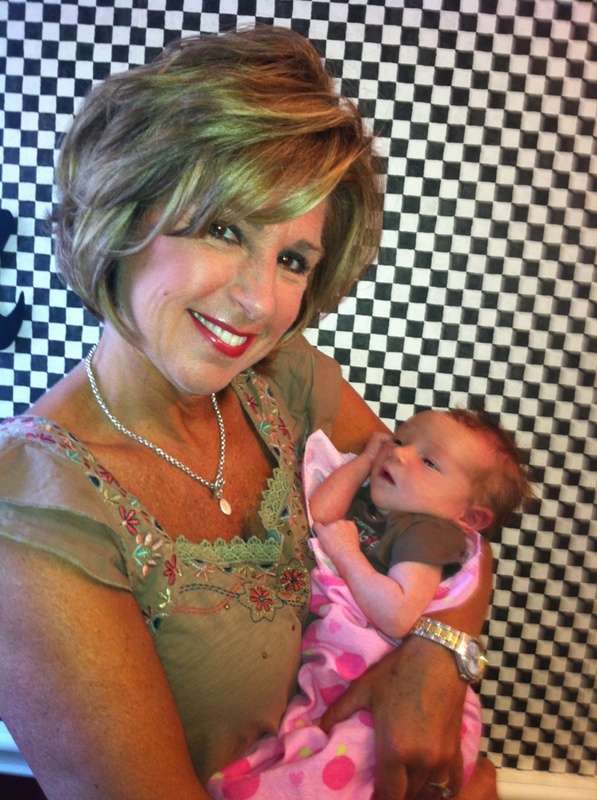 I have had such a blessed year by gaining 2 new grand children; Layla Elizabeth in July and Barrett James in October. My daughter Katy and her husband Ben decided to wait until the due date to find out what they were having. In today’s time that could cause a lot of people stress when decorating the nursery. 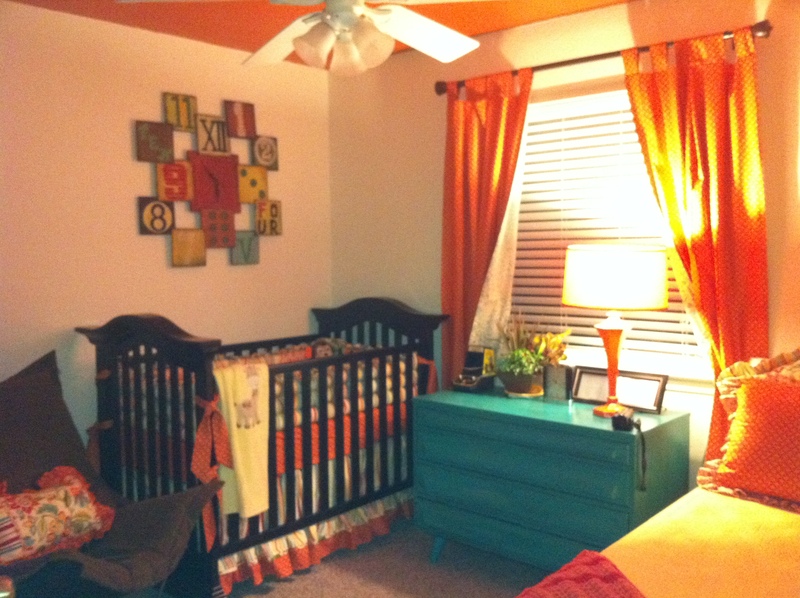 However, we enjoyed putting together a fun, colorful, gender neutral nursery. 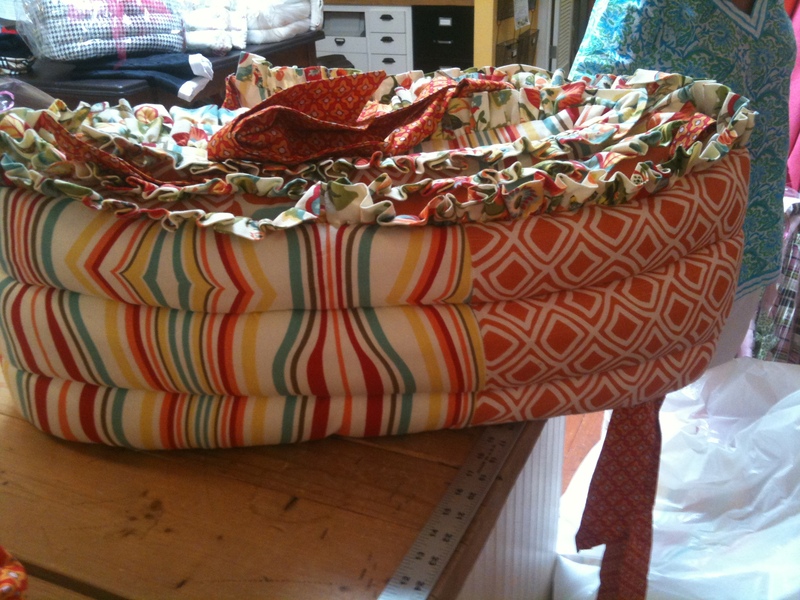 We are spoiled with access to a fantastic children’s fabric store @Graham Kracker in Midland who carry a wide array of fabulous fabrics, and mae all the custom bedding and curtains. In Show Me fashion you must first pick your theme/colors. 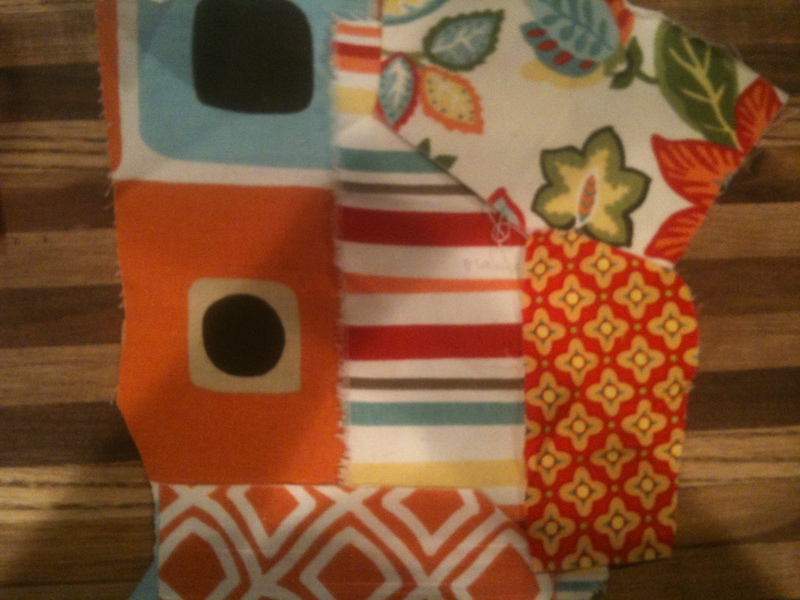 Katy loved Orange and Turquoise with a mixture of fun prints! Coordinating with the rest of her house she picked stripes and floral prints. 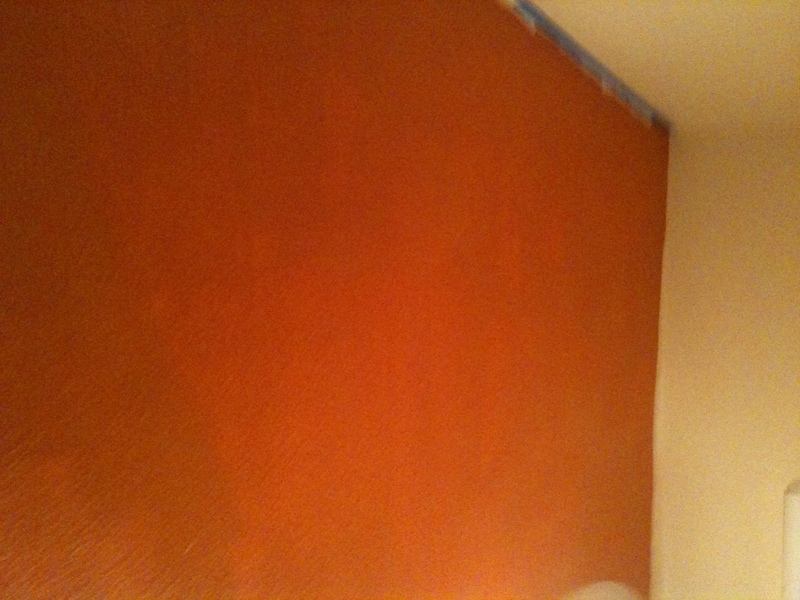 She took the diamond fabric and had @SherwinWilliams match a paint color for the ceiling of the room. 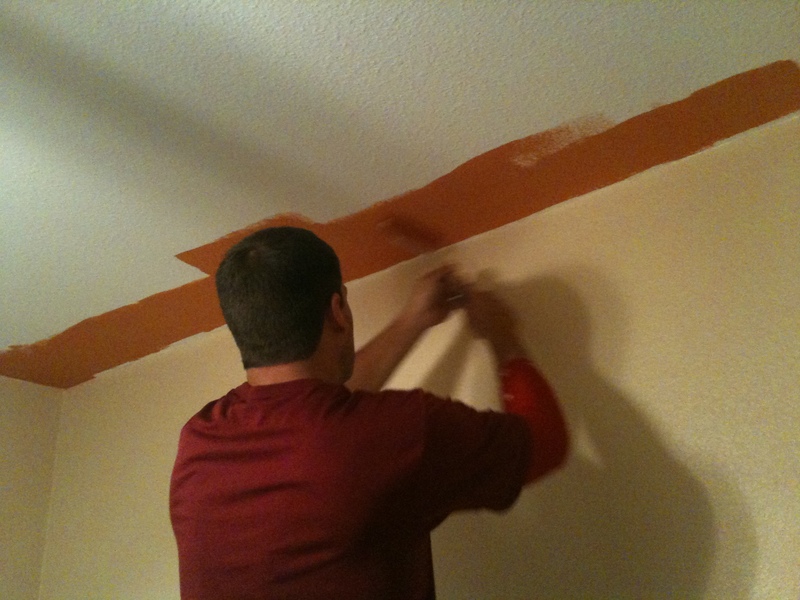 Painting the ceiling a color is a great option when ther is alot of pattern/color in the room. Katy had to use her negotiating skills with Ben, but in the end he agreed and even did the painting! 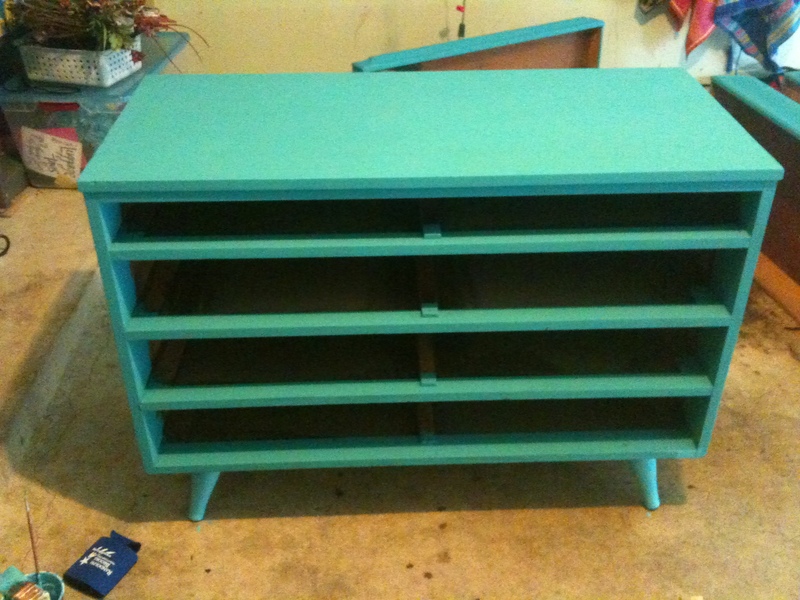 Next, Katy chose to re-purpose a dresser that belonged to her dad, Jim as a kid. She chose to paint it turquoise. To dull the old finish and prepare it to paint, a de-glosser or liquid sand is used. This is available at @HomeDepot or @Lowes. With a t-shirt rag wipe over all the surfaces with the de-glosser following the manufactures instructions. Paint the furniture with @delta Ceramcoat acrlylic paint available @HobbyLobby, or @Michaels. Tip: After desired color is achieved, use a wipe on poly varnish which is easy to apply using a t-shirt rag, follow manufactures instructions. Apply several coats for maximum protection. 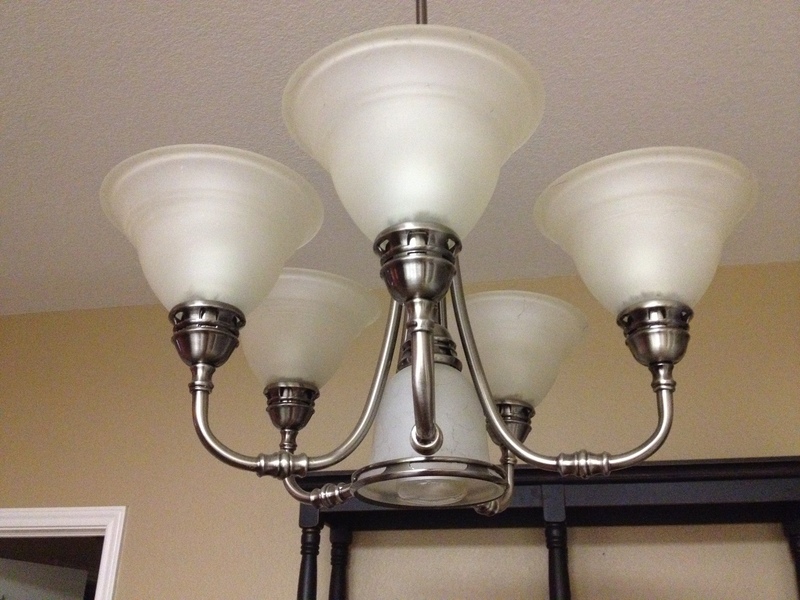 Matt, semi-gloss and gloss finishes are available. 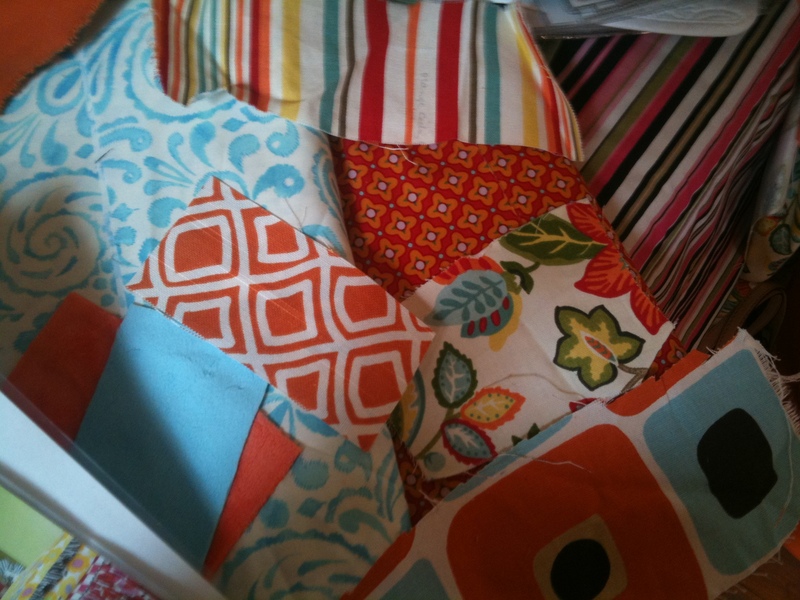 Katy has a very eclectic taste and enjoyed mixing all the fabric choices and colors to create the perfect bedding and room for the new baby (boy or girl)! What a fun room! 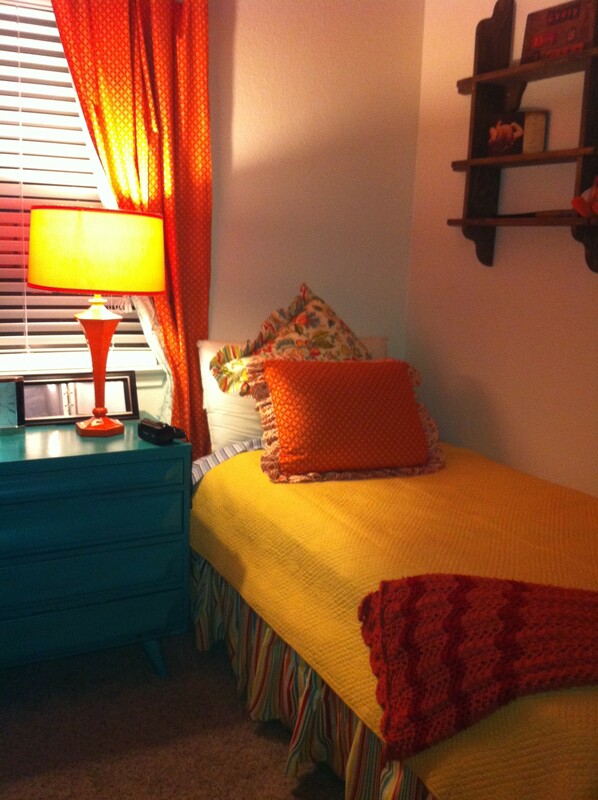 The hand me down dresser sports a fresh coat of paint and the orange lamp adds a pop of color! 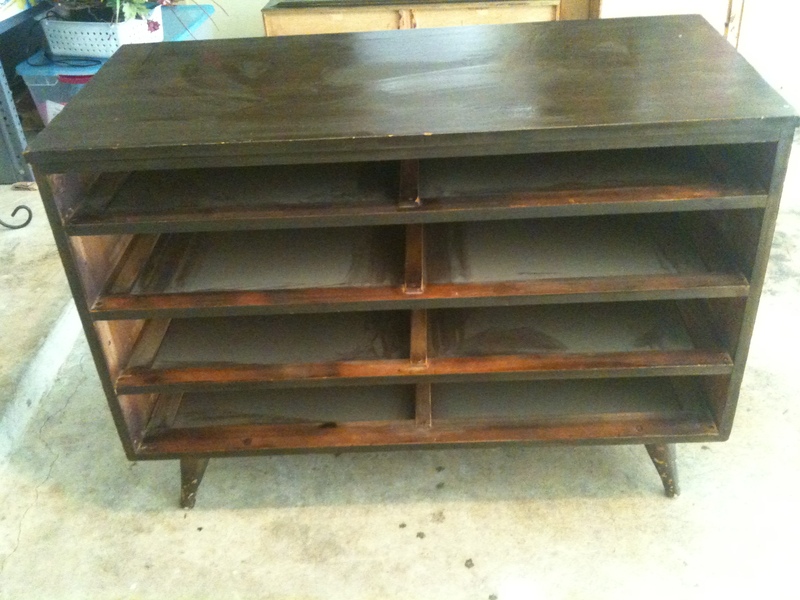 Re-using and repurposing an old piece of furniture is fun! 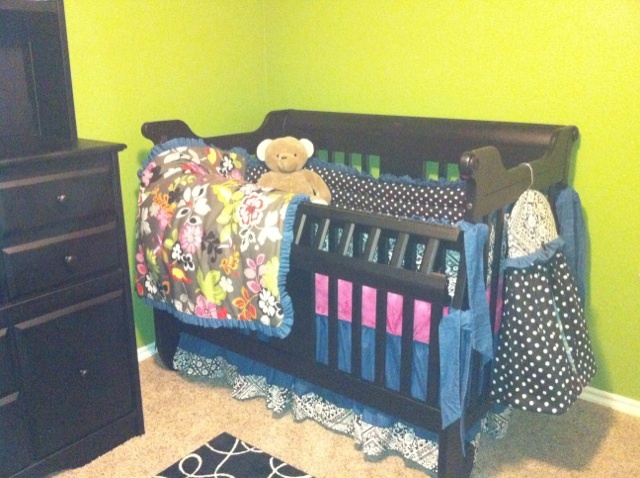 In addition to the crib bedding we also carried over the fabrics to the twin bed. 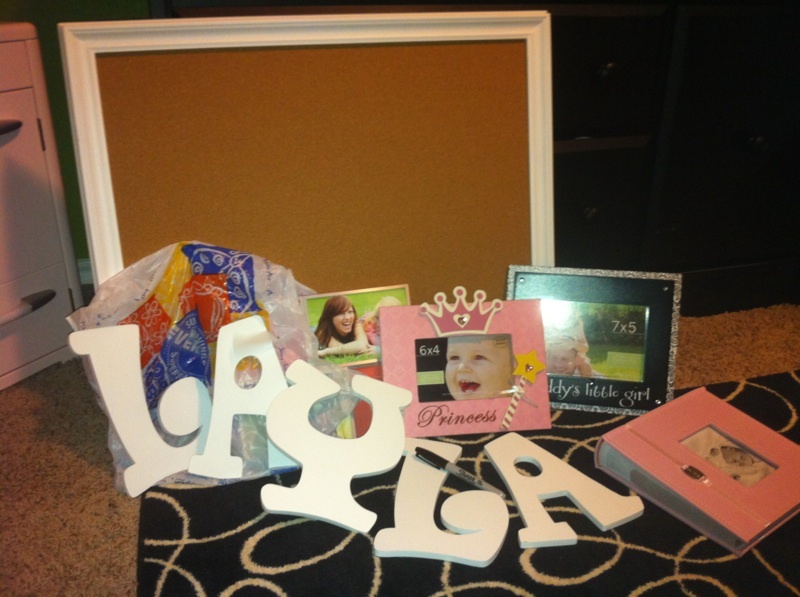 I hope you enjoy getting a few new ideas for a nursery! 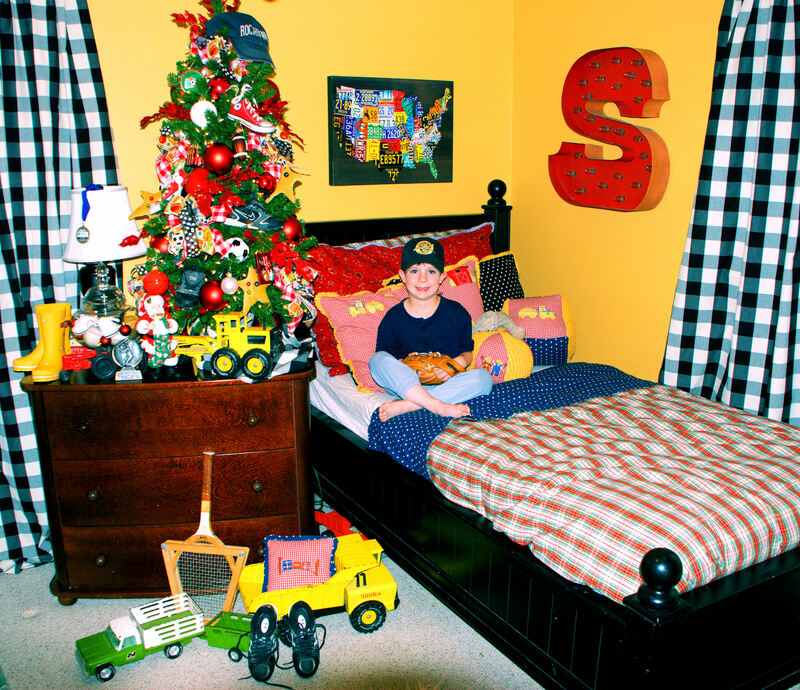 Barrett loves his room and his Granna for helping to make it happen the Show Me Decorating way! 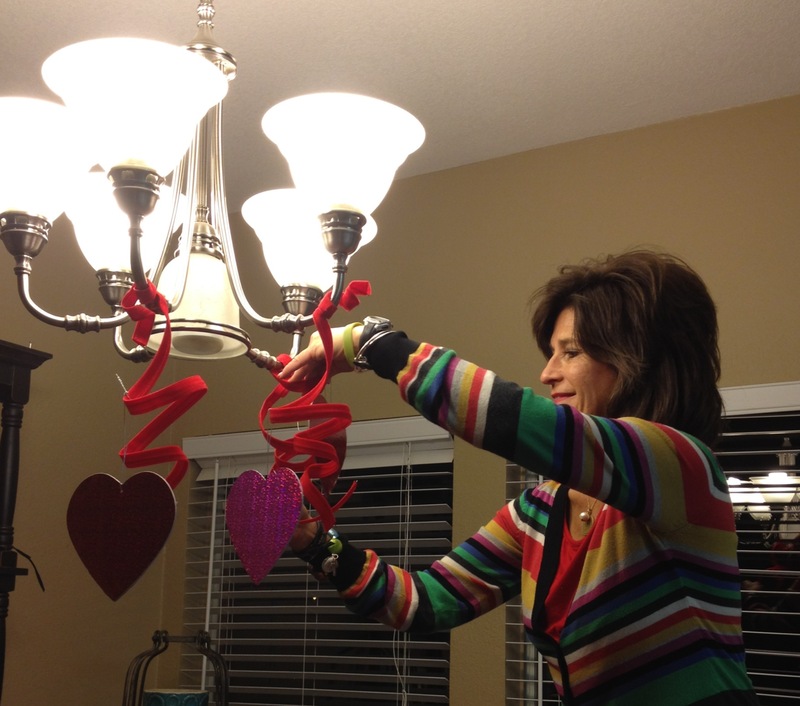 Show Me Valentine Decorating in Lights! 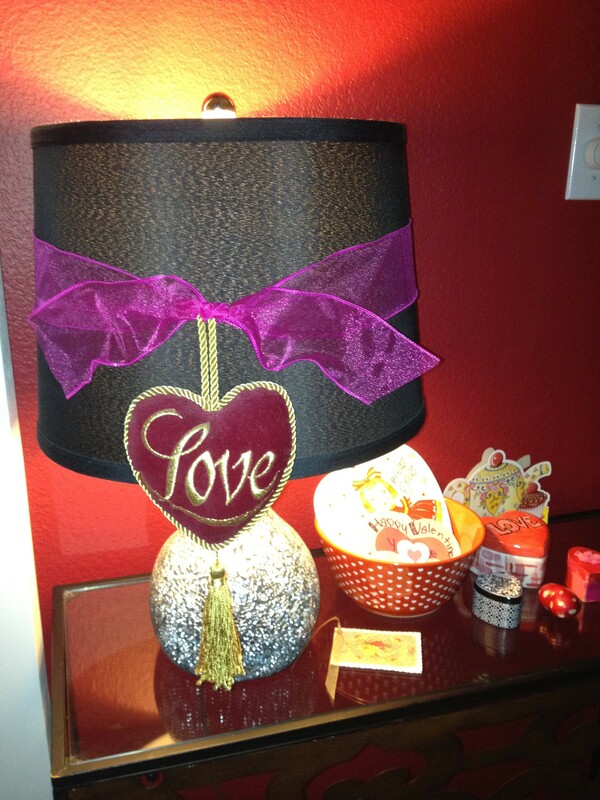 Dressed up lamp for Valentines day! 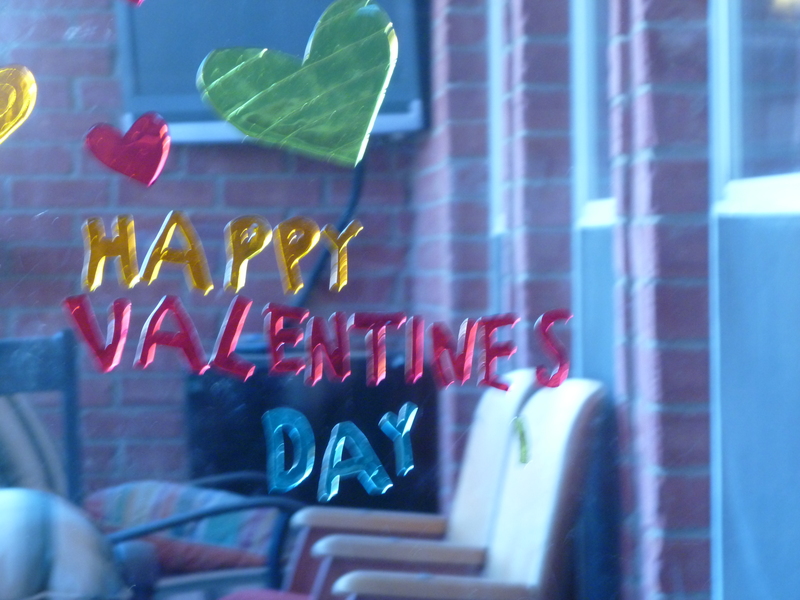 Love is in the air… at my house! 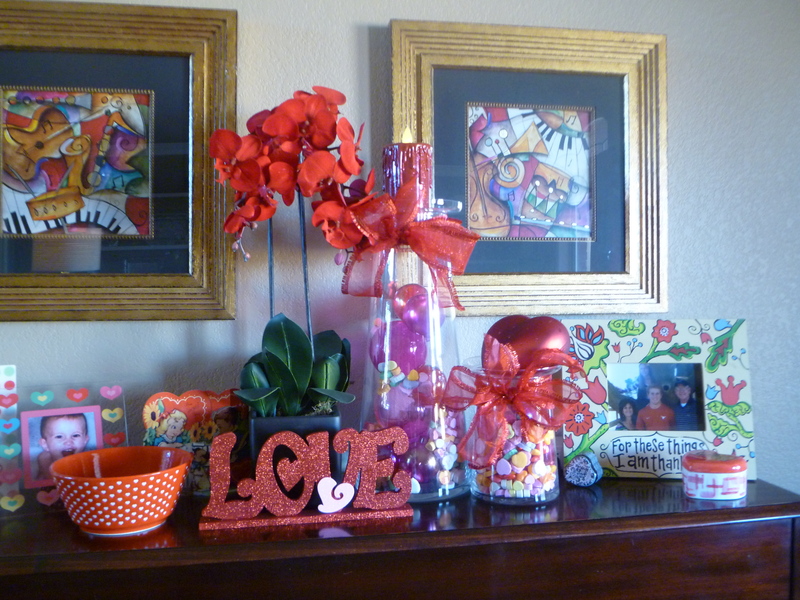 One of my favorite days to decorate for, Valentines. 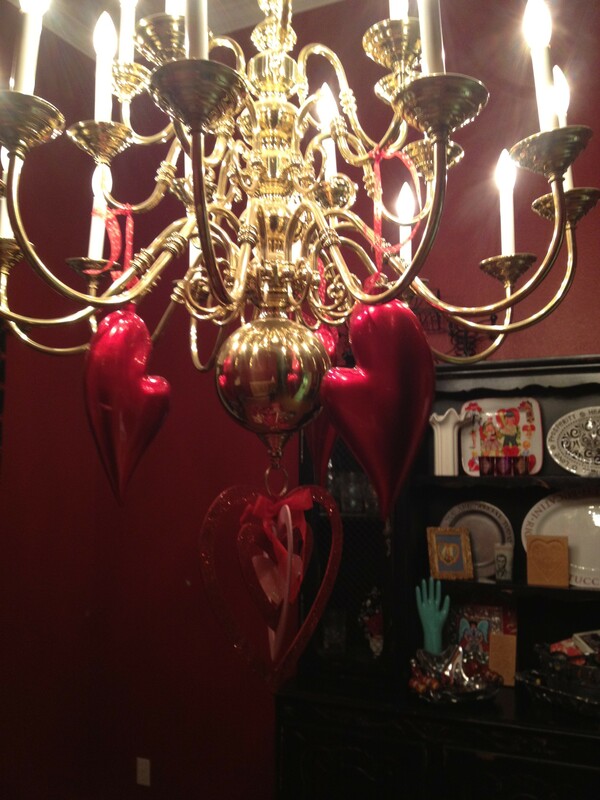 In the entry way I dress up the lamp with a sheer wired ribbon wrapped around the shade and tie on the puffy heart tassel. 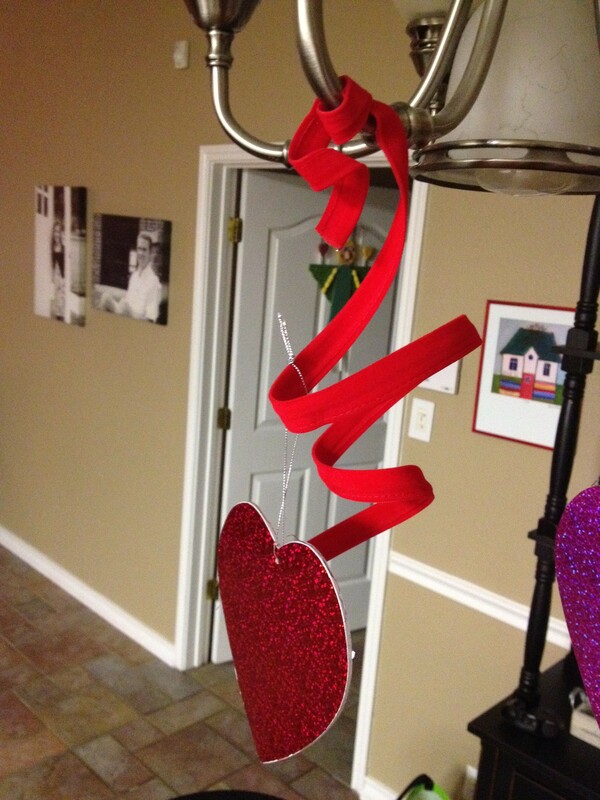 (last year this heart was hanging from a shelf in the guest room!) I love to use items differently each year. 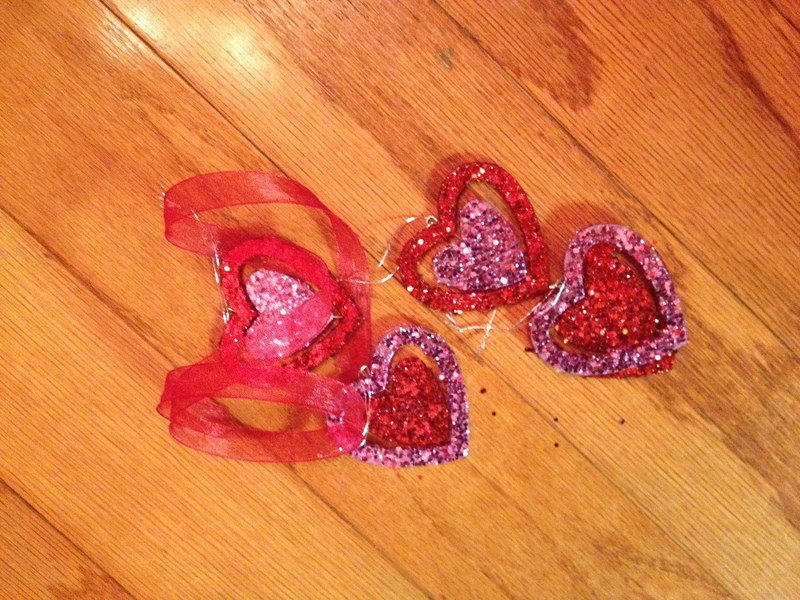 I also arranged my heart printed bowl, cute heart boxes and antique valentines sprinkled in! 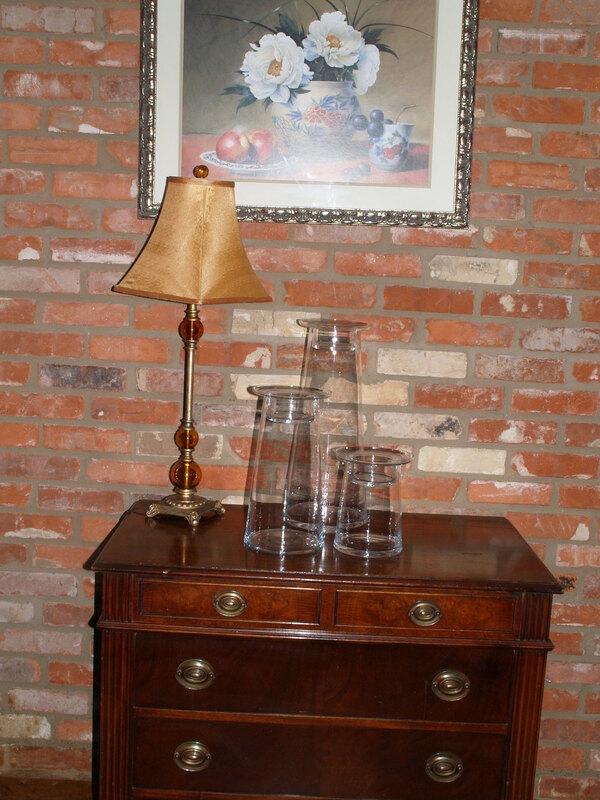 This create a fun vignette to welcome my guest. 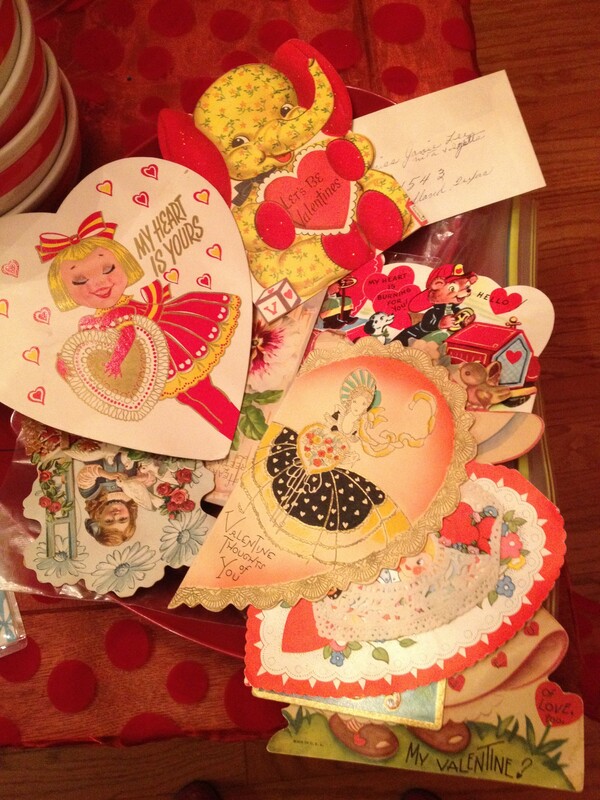 I love antique valentines, I also keep special ones the kids have made, and sprinkle them through out my decorating! Hint: I have big clear tubs, marked for the season or celebration, ie: Valentines, Easter/spring, Patriotic/4th of July, Fall, Halloween, Thanksgiving and of course Christmas!!!! (lots of tubs for Christmas!) Some of my items do double and triple duty! 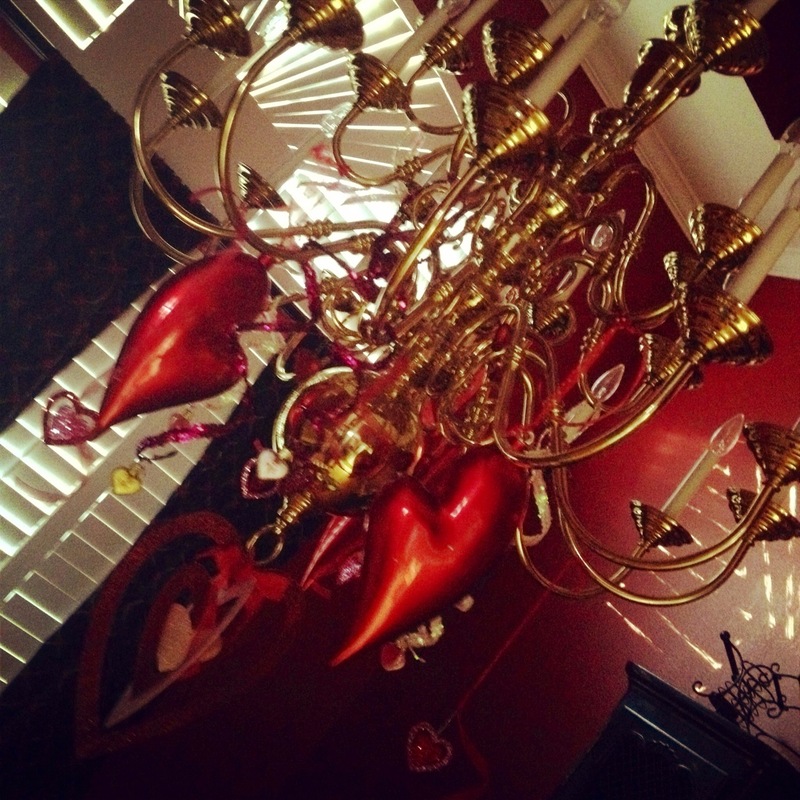 Now back to Valentines, so the chandeliers were jealous of the lamp being dressed so now it was their turn. 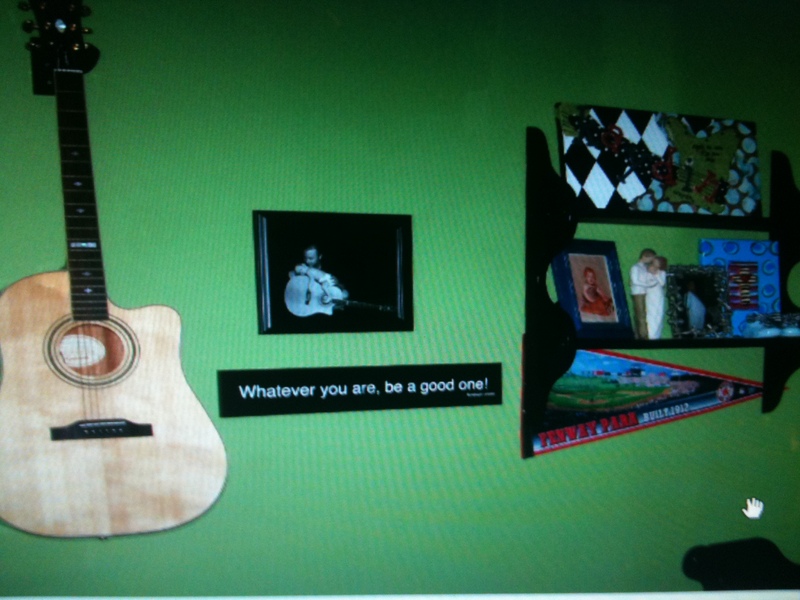 Yes, I do really decorate! 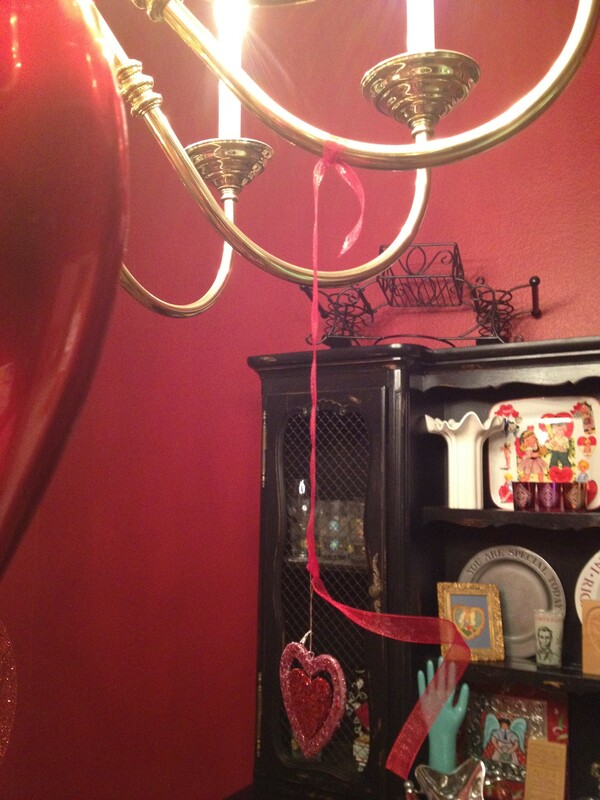 Red ribbon with a heavy wire is wrapped on chandelier arm, allowed to curl and light weight paper hearts are attached to the ends! 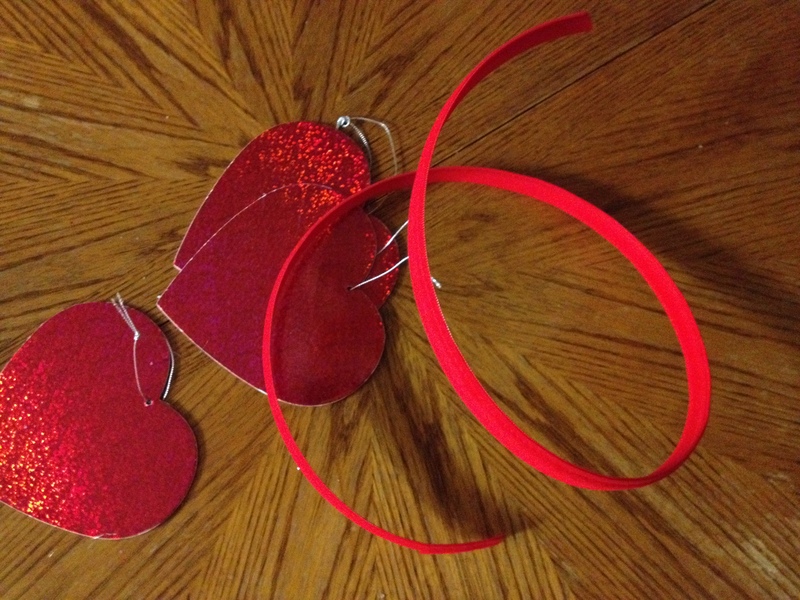 Bright red ribbon and hearts! 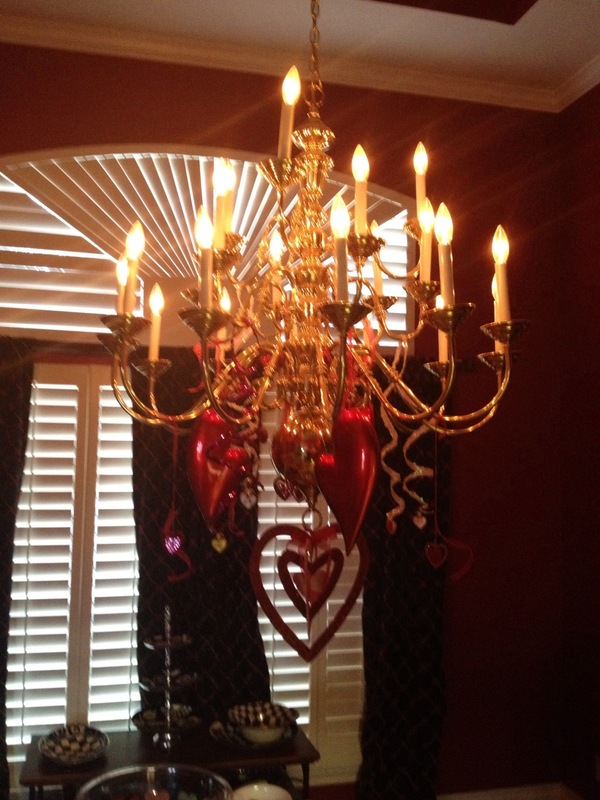 Now the Big Chandelier gets dressed! The before, waiting to be dressed for the party! What would life be with out Glitter! 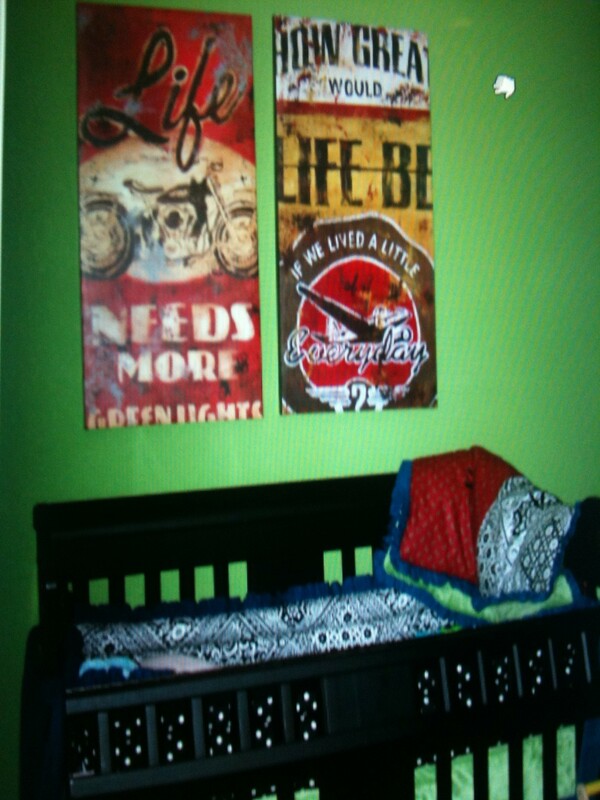 Thanks @hobbylobby for great selections and prices! 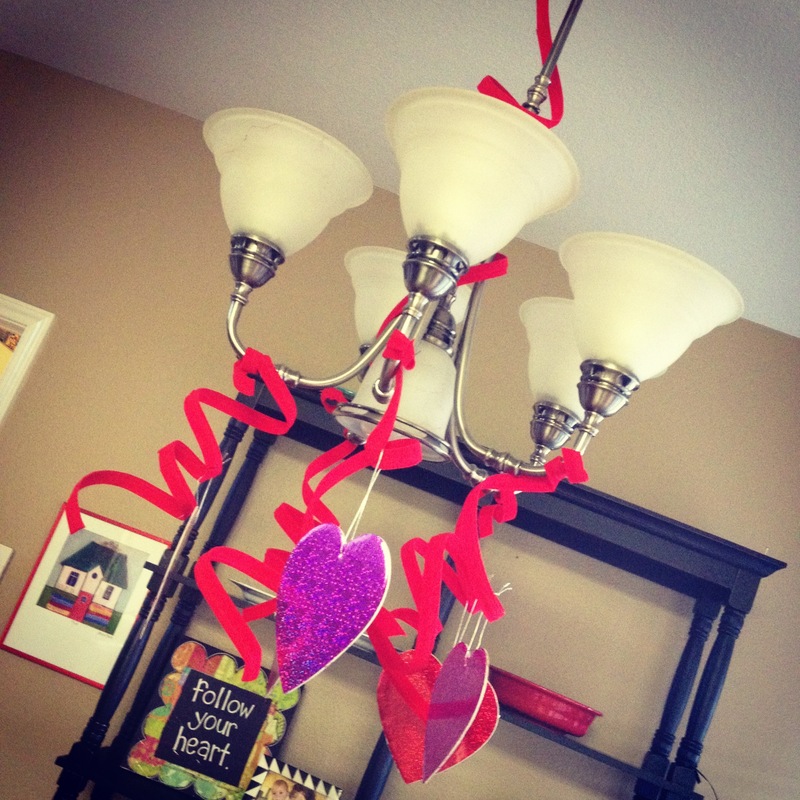 Use sheer red ribbon to tie on glittered hearts to chandelier arms! Shiny, glitter, glass and sparkle! 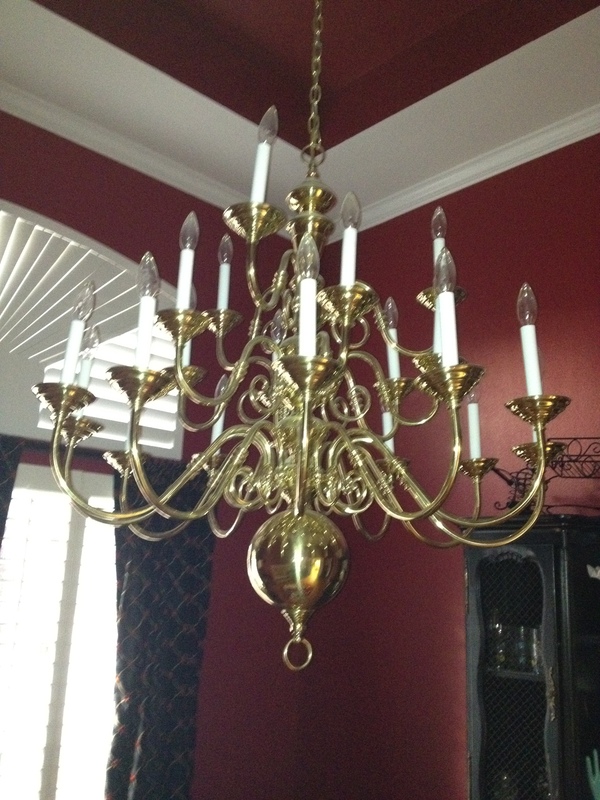 This Chandelier hangs over my table for the party and will be the main centerpiece. 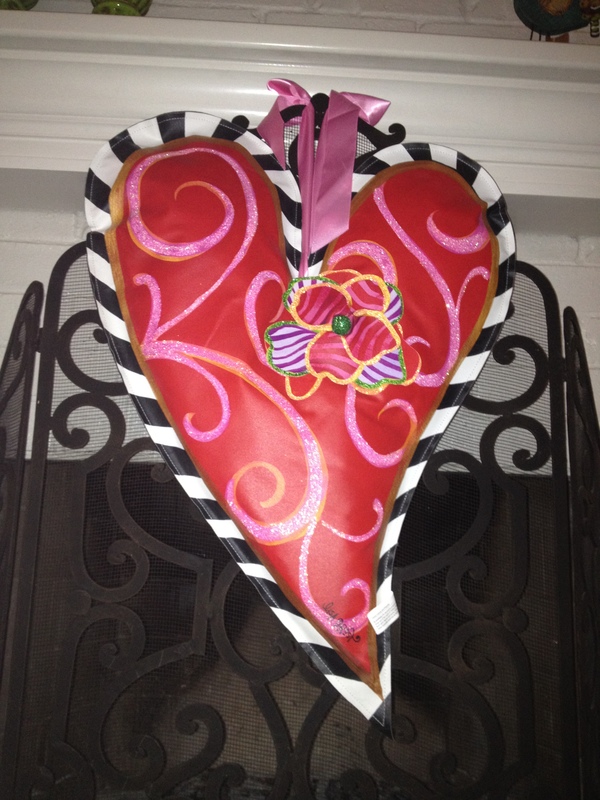 The Lisa Frost (@demdaco)puffy heart was the inspiration for my color story, and I will show you next how it was used in my doorway wreath……..
May you be inspired to create as we educate you to decorate! Valentines Day Show Me Style! 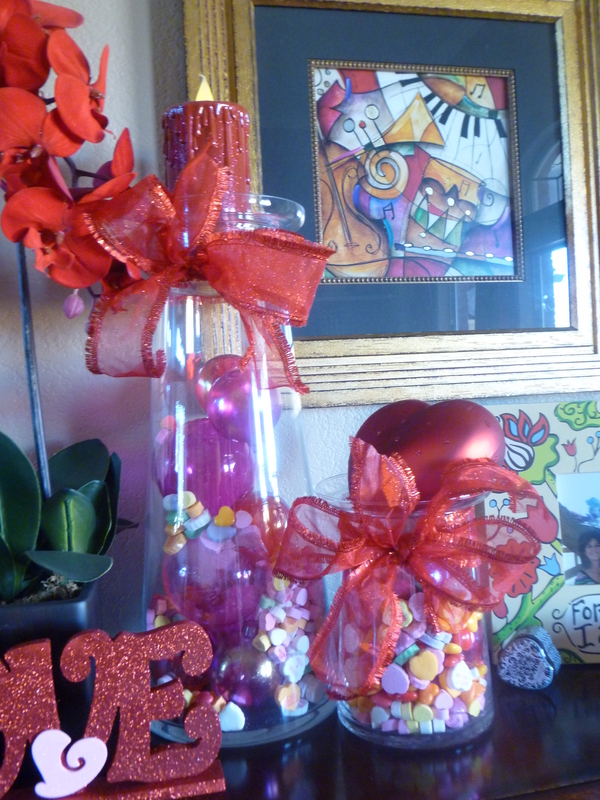 The piano top was chosen to display the Valentine decorations. 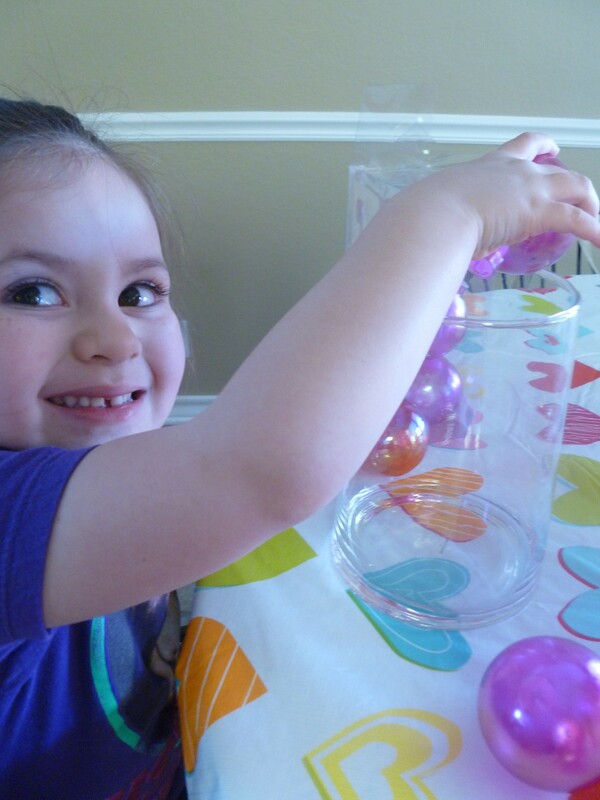 Emma gets started filling a clear candle jar. 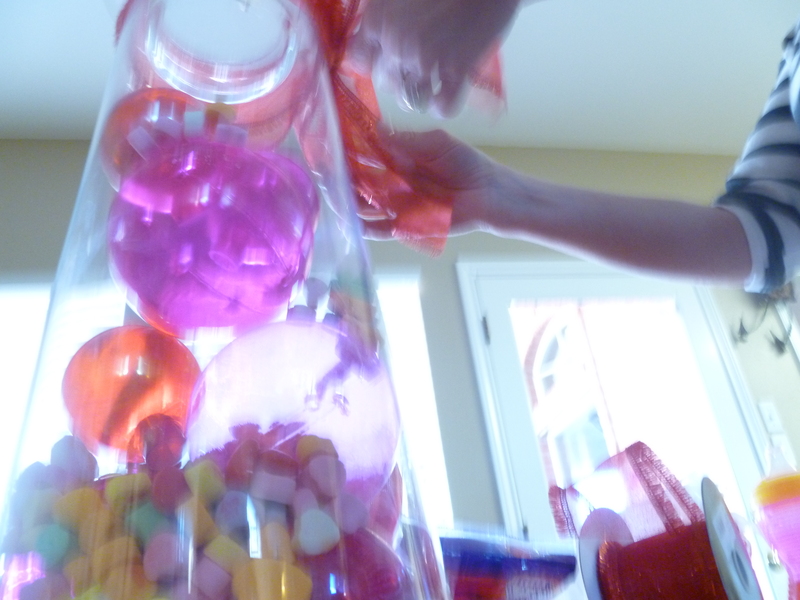 Emma fills the clear candle jar (any clear glass container will work) Plastic (Christmas balls in pink and red) make great filler! Ready to add some Ribbon! 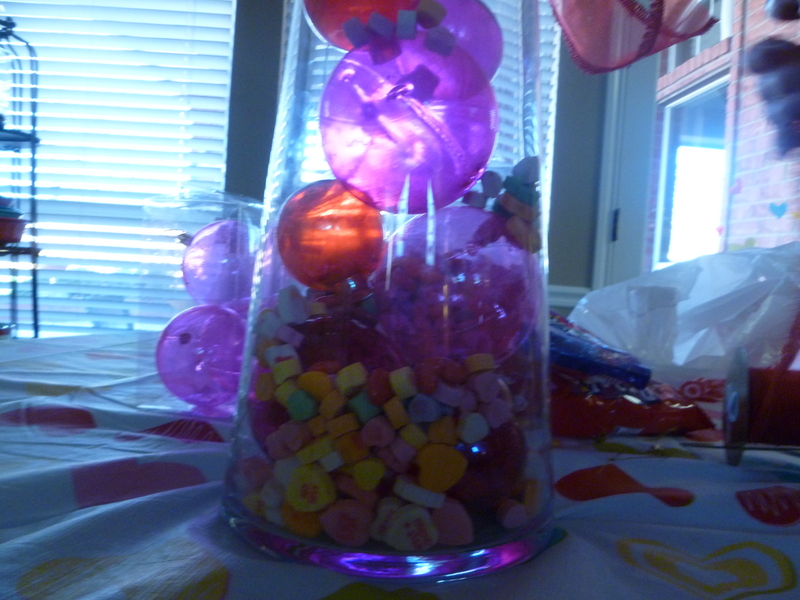 Ribbon on the top of the candle jar adds a finishing touch! Knowing how to tie a bow gives you the confidence to decorate for so many celebrations and events! Emma had fun with the gel stickers on the back door while I finished up the candle jars and top of the piano! 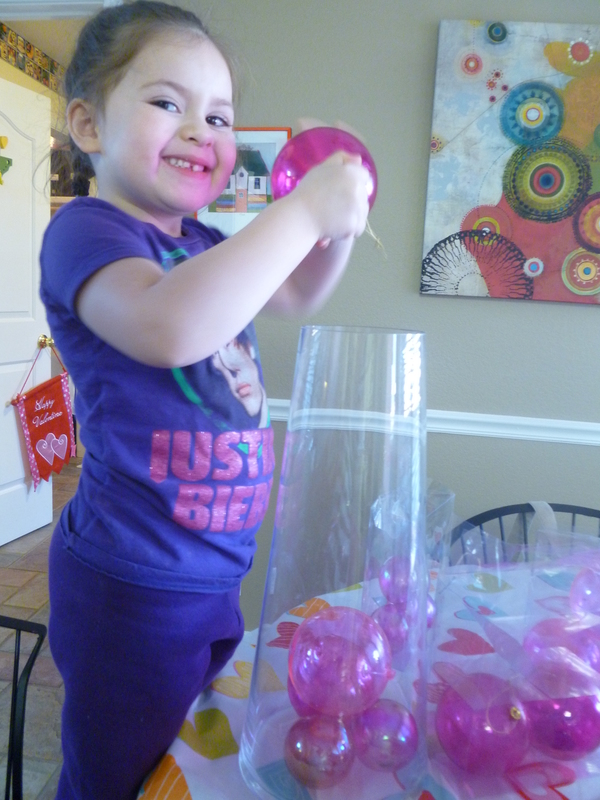 It is fun to involve the kids or grandkids in the creative process! Great time to spend together and fun to let them express themselves! Sheer red ribbon adds the finishing touch to the candle jars, a candle tops the tall one and a big red heart tops the small one! Love is in the air! 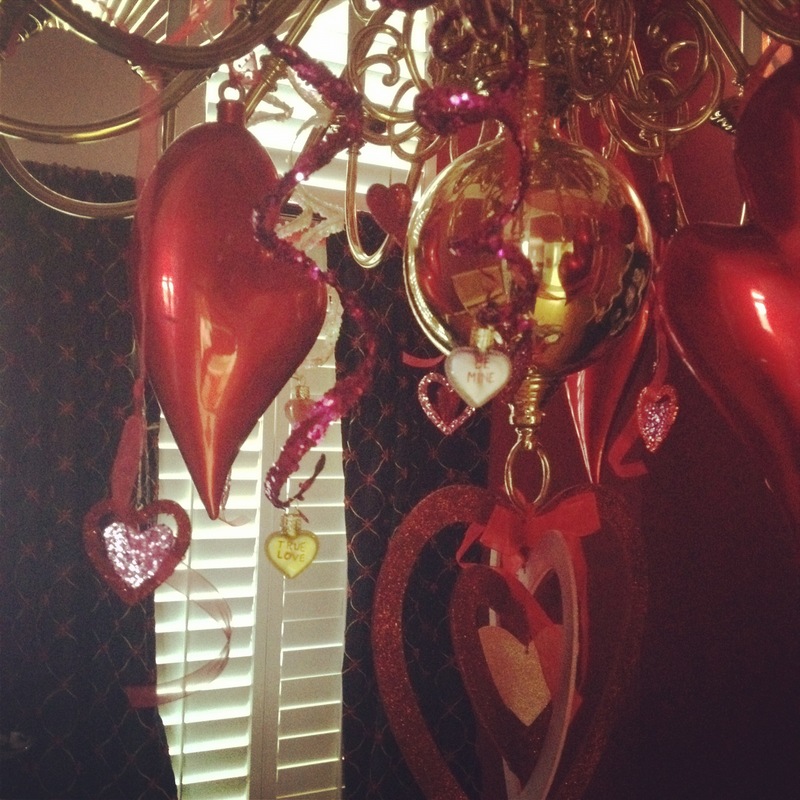 Family pictures, antique valentines, and a collection of all things hearts! Now its time to decorate my front door and Welcome my friends and family to my Birthday party……. 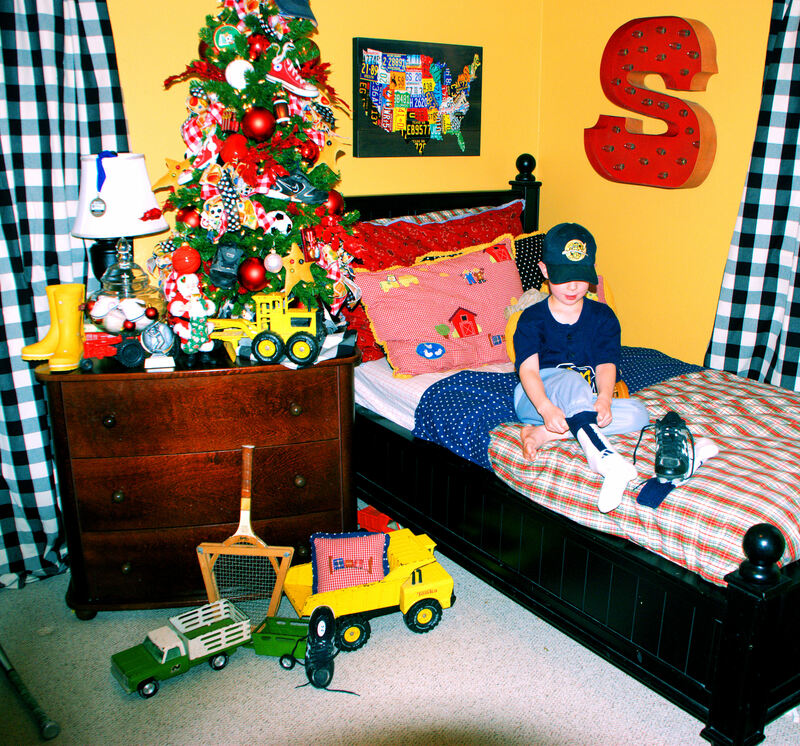 Use items your child loves to decorate a small tree in their room. 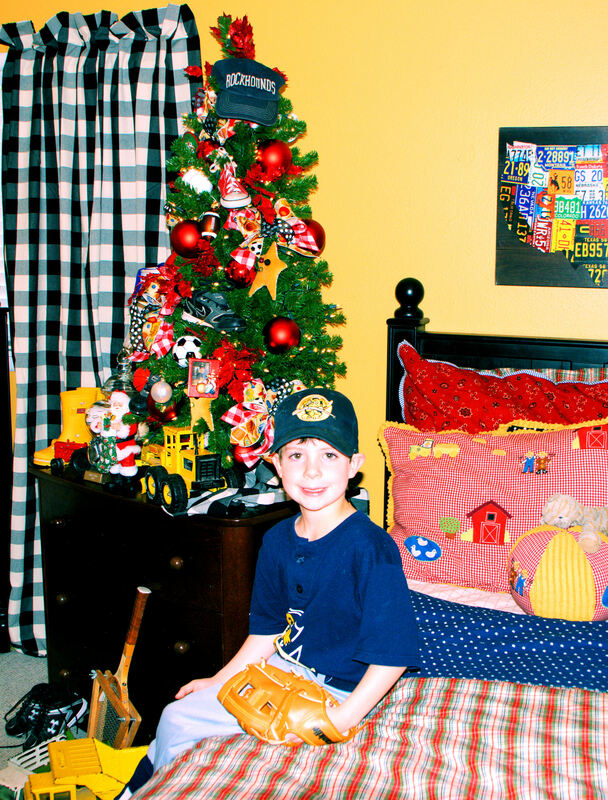 For a boy, use those Trophies that are collecting dust on the shelf or a favorite collection of baseball gear. Dump trucks, baseballs and bats! Paxton's winning baseball team's cap shows off as a tree topper! 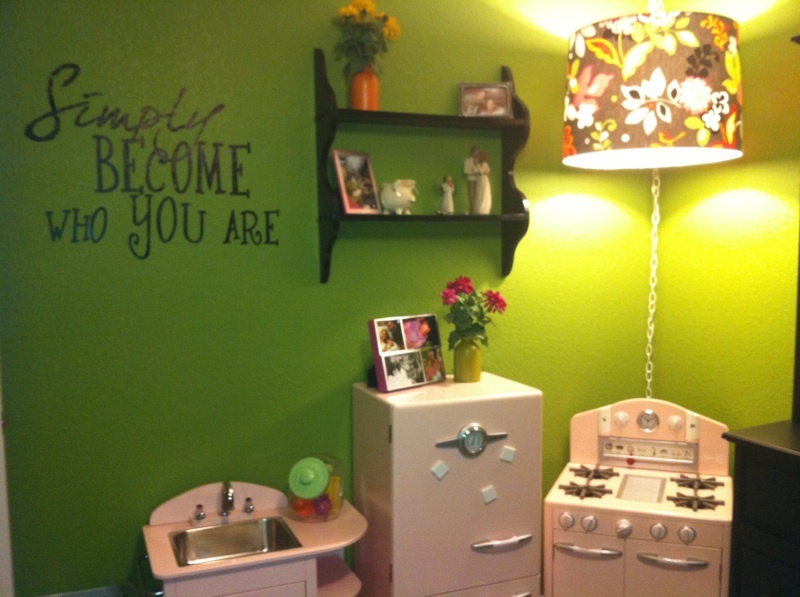 For a Girl, you could decorate with ballet shoes, cherished dolls or teddy bears. 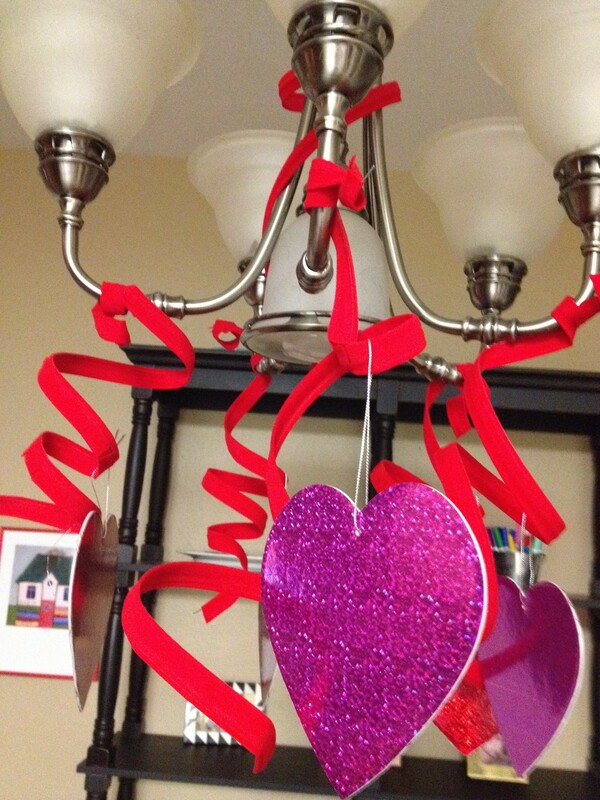 Tie in the decorations to their room’s decor by coordinating the colors of ribbon, balls and floral sprays. Little girls love dance and dolls and tea parties! In Libby’s room a small potted tree was used, she even had a favorite tutu that was placed around the base of the tree. the bows, balls and florals all matched her room and showed off her collection of tea sets, baby shoes, favorite stuffed animals and dance shoes! All of the memorabilia was wired on with floral wire. A miniature table set for tea graced the childs table and Santa is ready for tea and cookies! Libby is all set for a tea party! Libby serves her doll some tea! 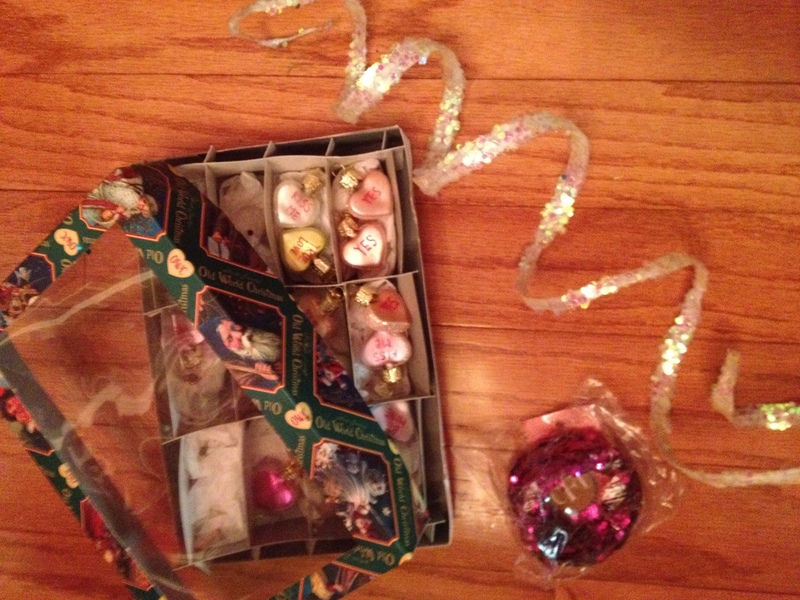 Paxton and Libby’s mom had a collection of treasures stored away in boxes. Now the treasures can be enjoyed by all through the holiday season! Show Me a Thankful Kids idea! Don’t forget the kids table! It can be covered in butcher paper with cups of crayons for them to draw what they are thankful for. Great way to entertain while the Turkey and all the fixin’s are cooking! 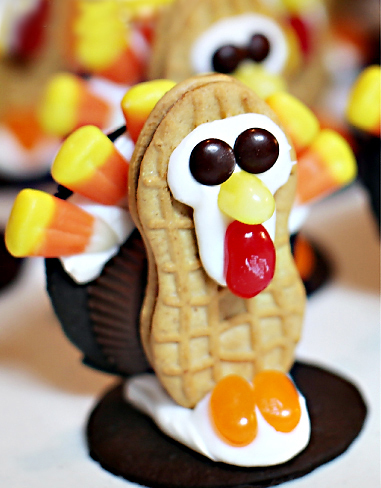 Also fun are making turkeys from cookies and candy. Great project for the” big kid ” to help the “little kids” with! Here are my favorites! I discovered these while “working” on Pinterest! Addicted anyone? 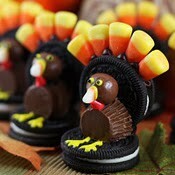 Love this Oreo turned turkey! We will make this one! This one makes me laugh!